PICKIT3 seems to be a DEGRADED version of PICKIT2 . 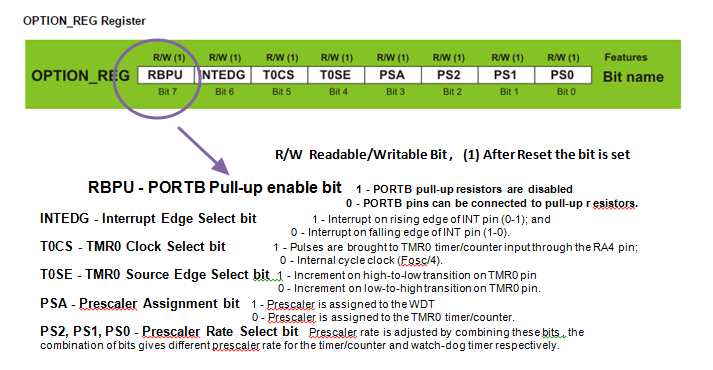 PIC may be a Microcontroller Giant , but a newer version of Toolkit should be more user friendly than the previous versions.In case of PIC the design Team has never bothered this. 1. 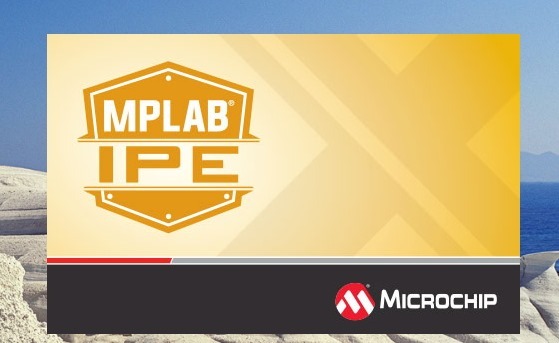 The little useful standalone program PICKIT2 to fuse HEX files is scrapped now.There is no standalone program to fuse HEX files.Now you need to install MPLAB IPE along with MPLAB X IDE & use that for fusing target IC with HEX file. 2. 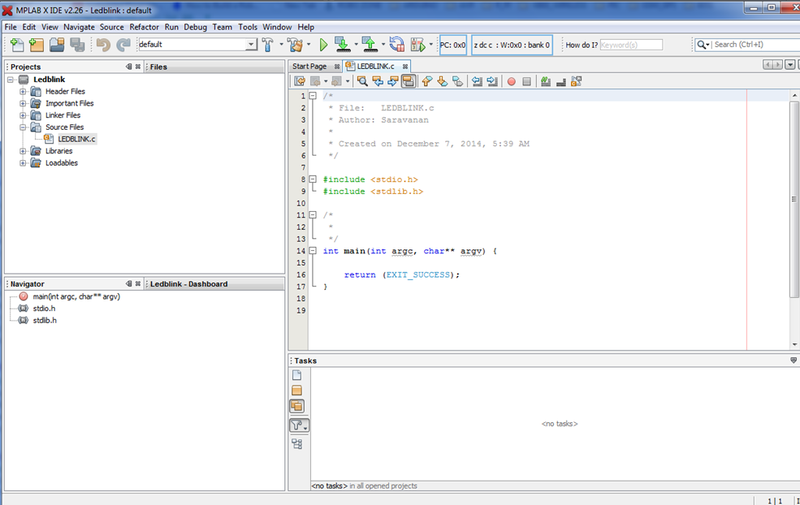 PROGRAMMER TO GO function of PICKIT2 is scrapped in PICKIT3. 3. 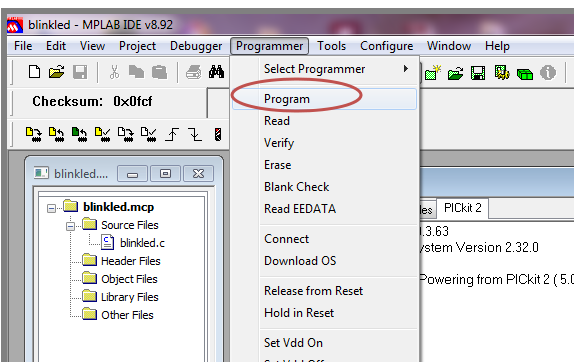 TARGET is not powered automatically in PICKIT3. 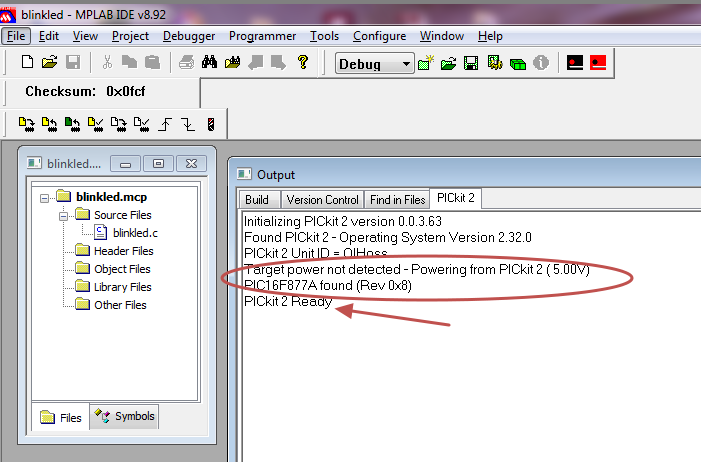 In PICKIT2 Automatic Power feature is enabled by default.In case of PICKIT3 you need to CONFIGURE manually , else you get TARGET NOT FOUND error. 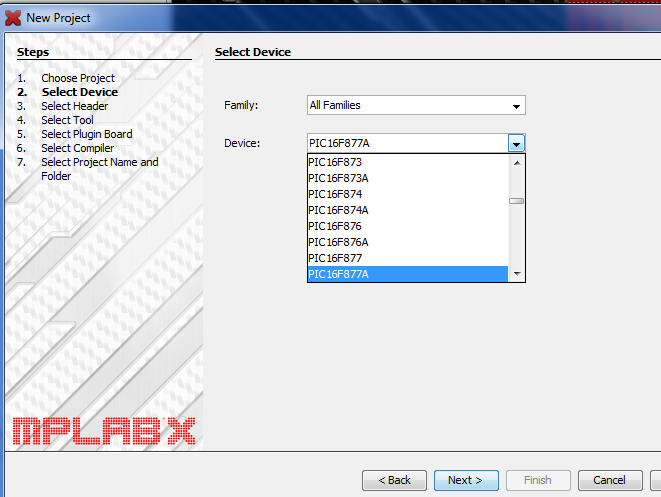 4.PICKIT3 does not detect DEVICE automatically.You need to select the device from drop down list. 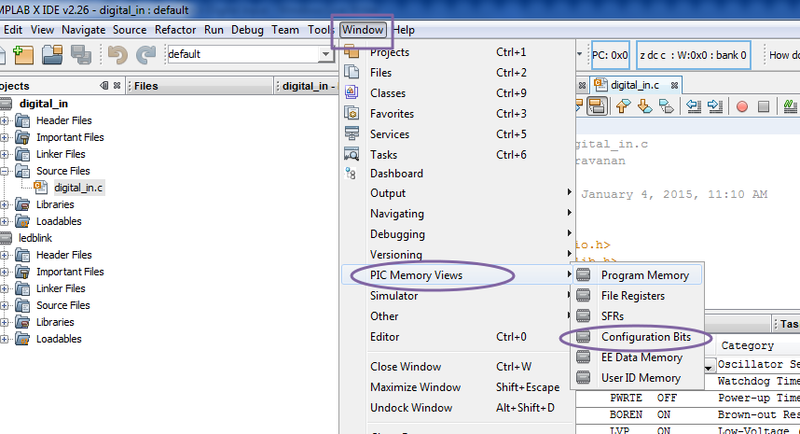 5.PICKIT3 uses PIC24 series MCU , while PICKIT2 was designed on PIC18 series.But PICKIT2 seems to be faster than PICKIT3. 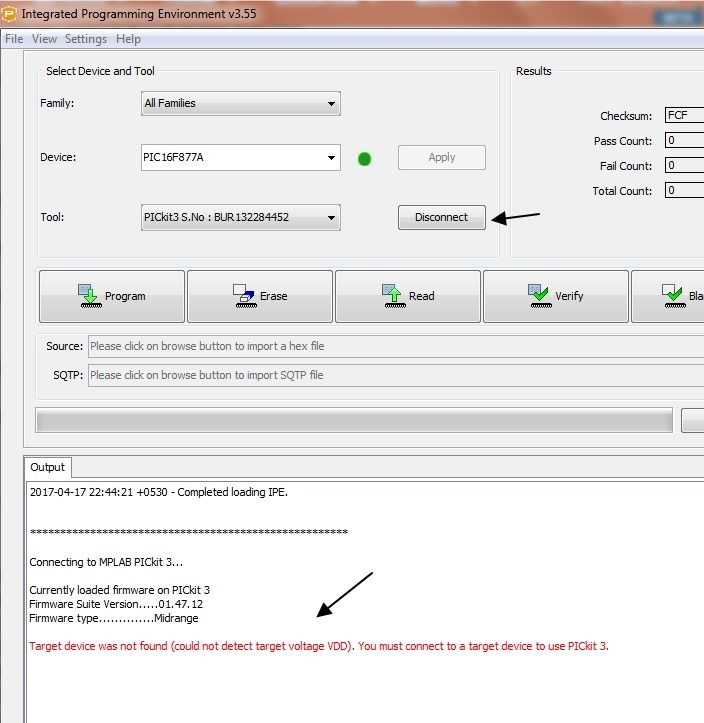 6.If you change the target IC , Firmware upgrade happens every time in PICKIT3 , an annoying feature. 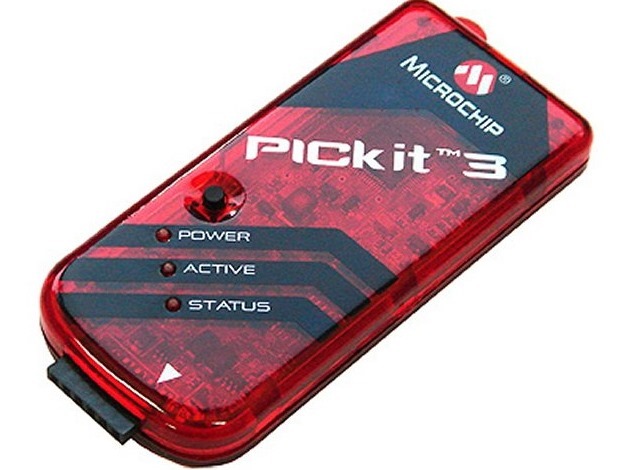 As MICROCHIP has stopped production & support to PICKIT2 we’ve to live with PICKIT3.Let us now see the solutions for common problems faced in using this “ADVANCED Device”. 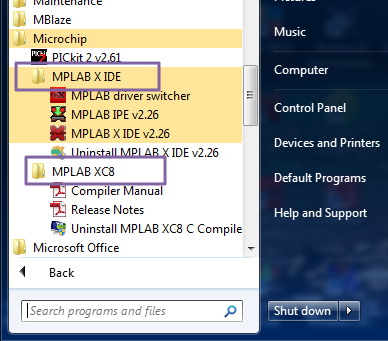 You can fuse the HEX file from within MPLAB X IDE or through MPLAB IPE..
From within MPLAB IDE click the Icon with down Arrow image “Make & Program Device Main Project”. 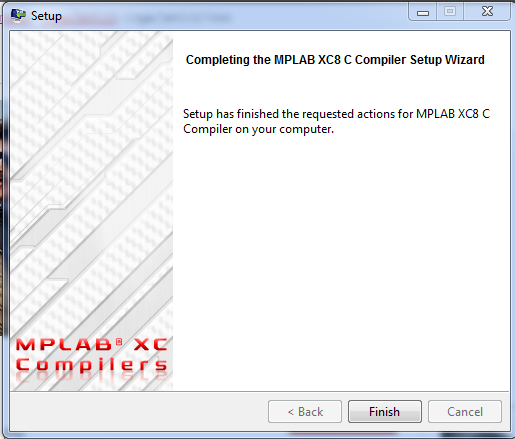 The project is now BUILD. But you get TARGET NOT FOUND error. Now the target is detected & HEX file fused on to target. 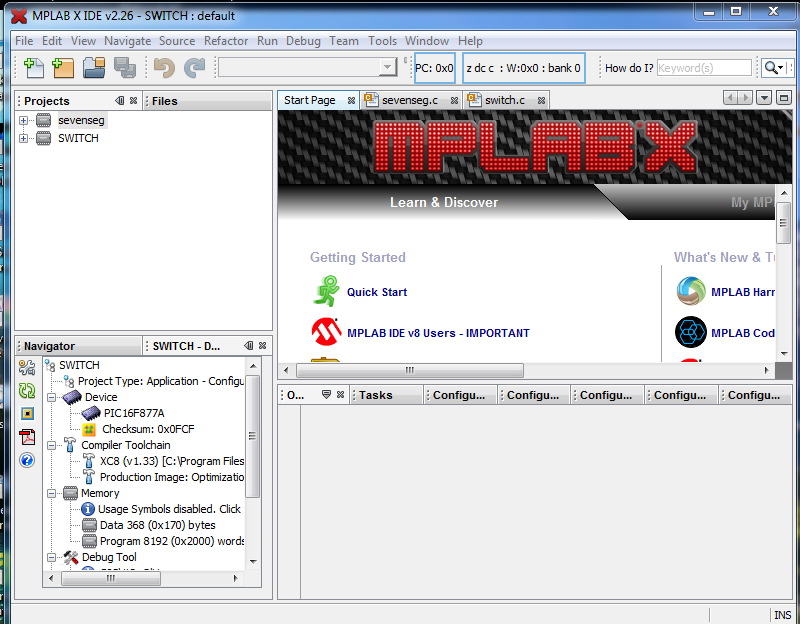 From MPLAB IDE click RUN –> BUILD MAIN PROJECT to create the HEX file. 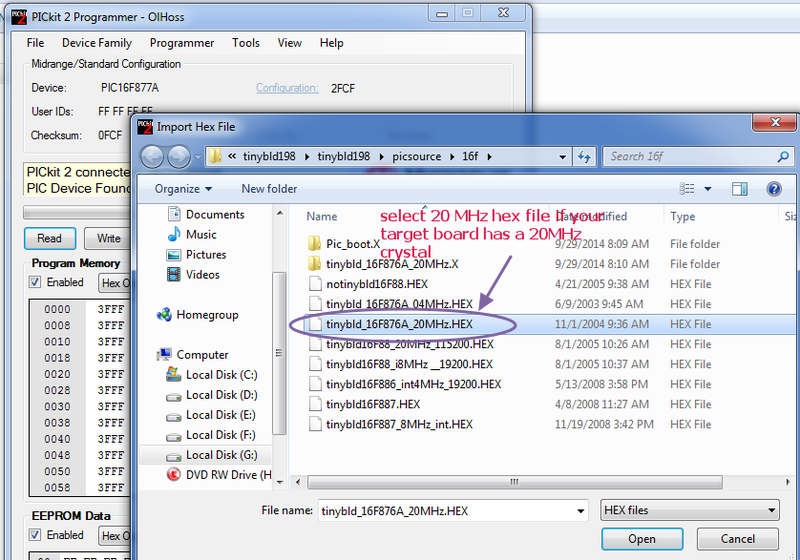 Note the location of HEX file. You get Target Not found ERROR. Now a new set of buttons appear on left side. The target is found & connected now. 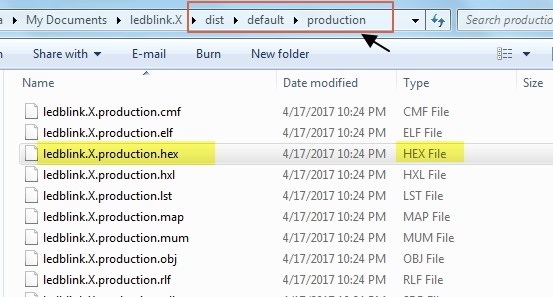 Click the browse button & navigate to select the HEX file stored. 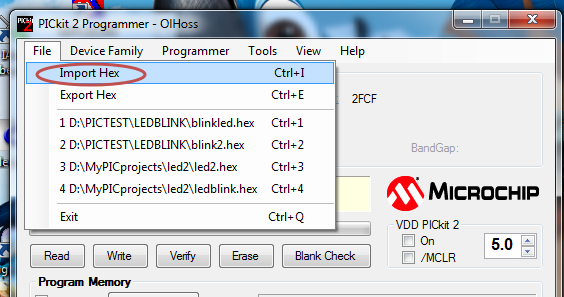 Click PROGRAM button to fuse the target chip with selected HEX file. 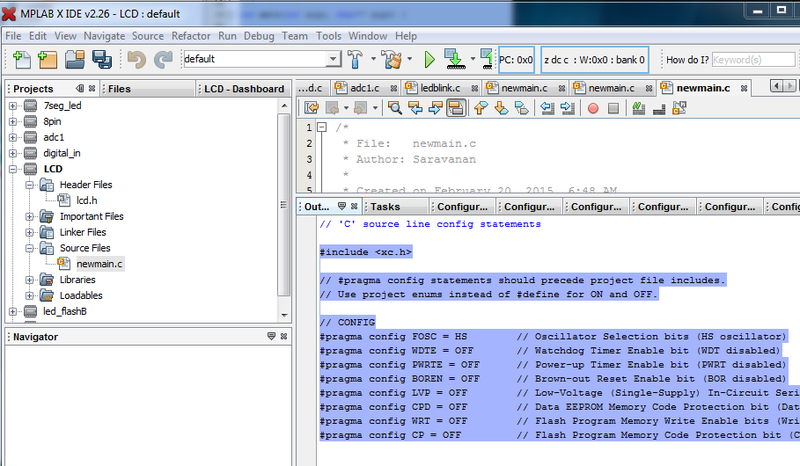 In this post we shall work with the HELLO WORLD program ,blinking an LED. 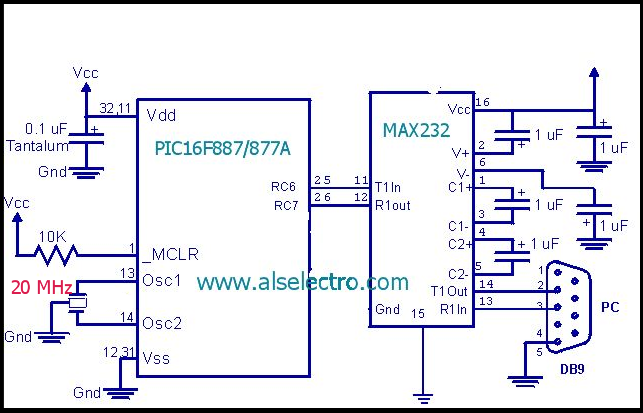 Port Pin RD7 is declared as output where an LED is connected through a current limiting resistor of 470 ohms.External crystal of 16MHZ is used in the circuit & this is defined in the configuration settings. 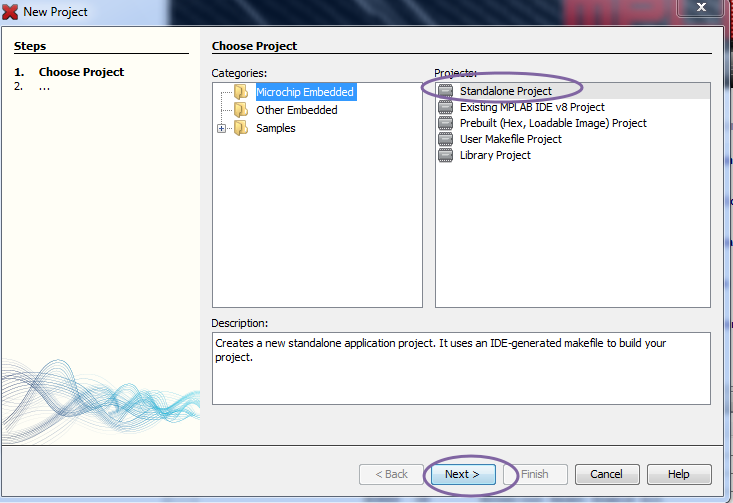 A New Project window opens.Select the category “Microchip Embedded “ & under projects select “Standalone Project” . Click on Next. 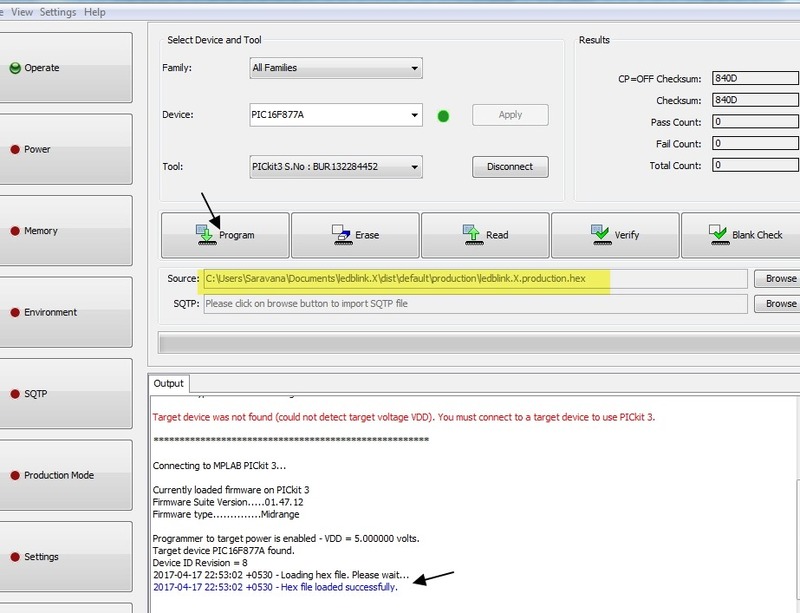 Next step is to select your target device.Under Device bar you can type in PIC16F877A or you can select from the list of drop down menu. 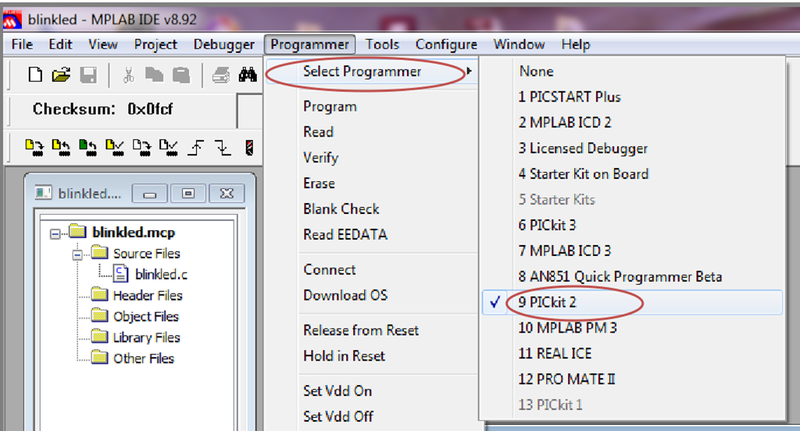 Now select the Tool as PICKIT2 . 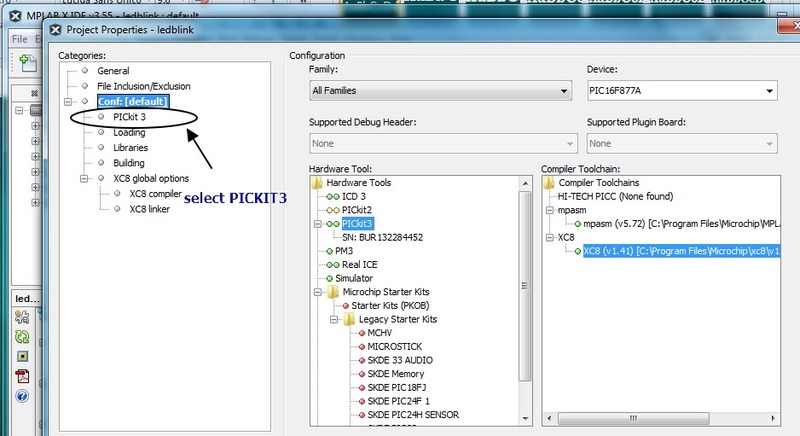 Other options are PICKIT3,REAL ICE & Simulator.In this demo we’re using a PICKIT2 hardware. 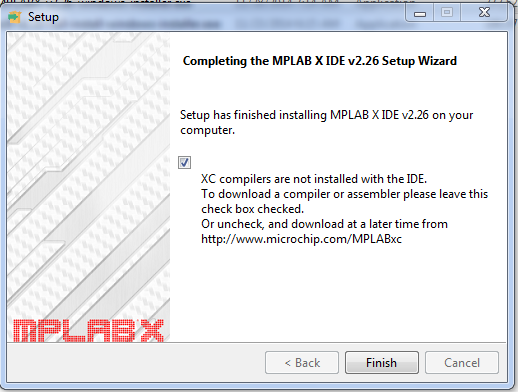 Next is the selection of Compiler.You can see a list of compilers installed including MPASM (assembly language) . 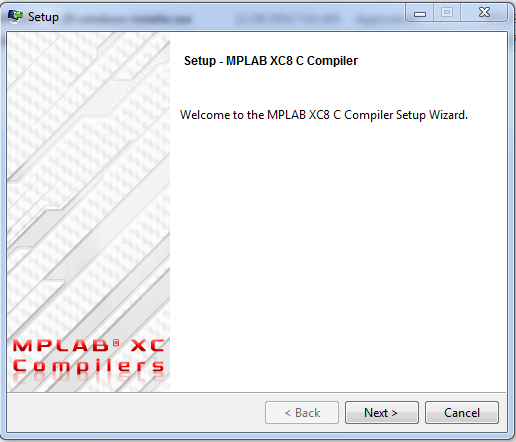 MPLABX allows usage of old HITECH C compiler also. 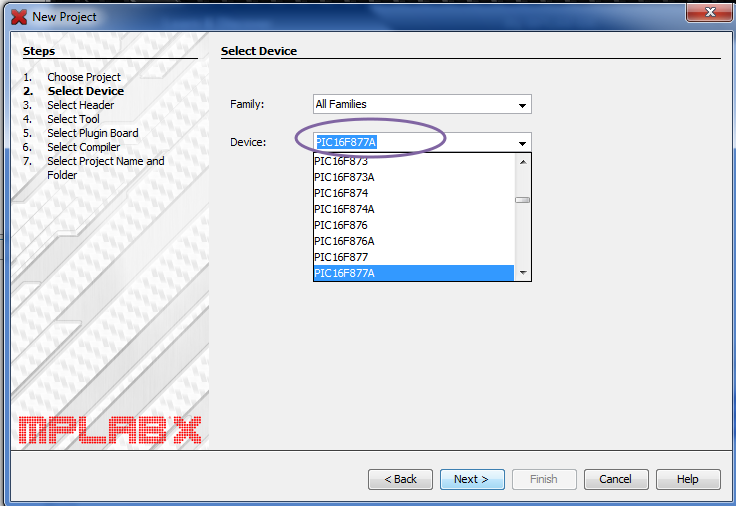 The XC8 will show up in the list if you had installed it correctly. 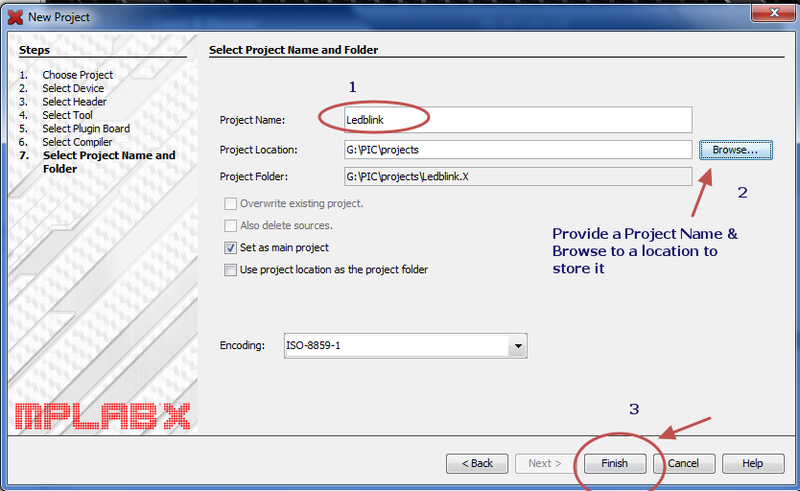 Now provide a Project name “LedBlink” & click on Browse to select a location to store the Project. 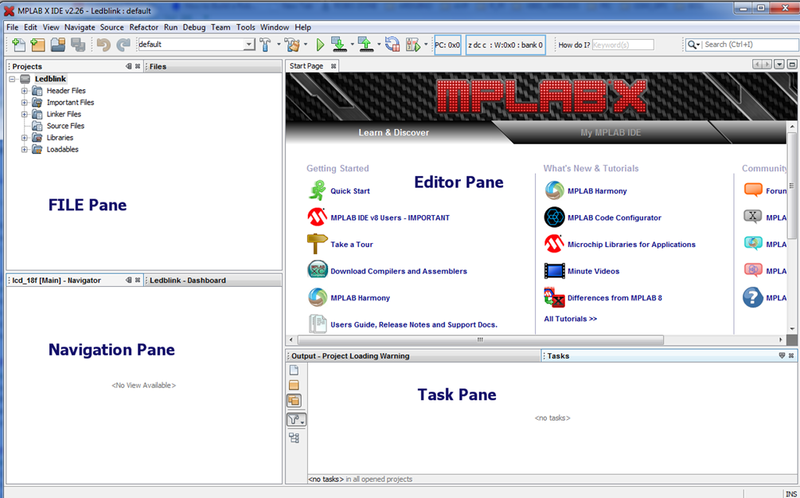 The MPLAB project IDE opens with 4 panes.FILE pane, Navigation pane, Editor pane & Task pane. 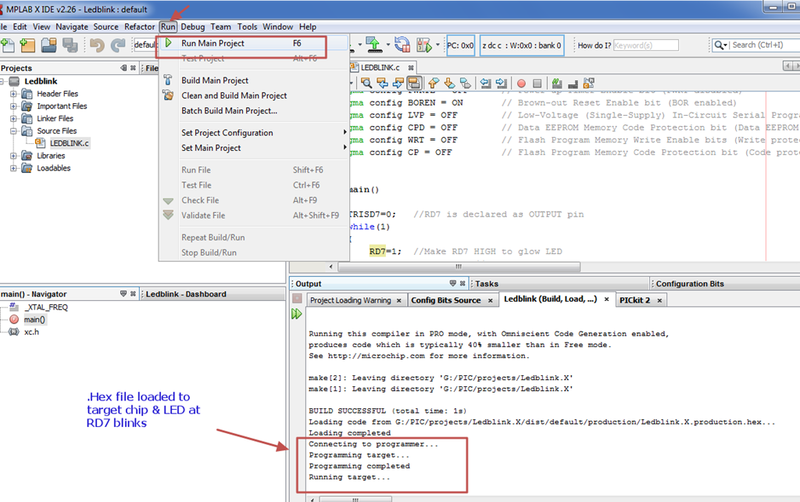 Inside FILE pane you can see your project LedBlink. 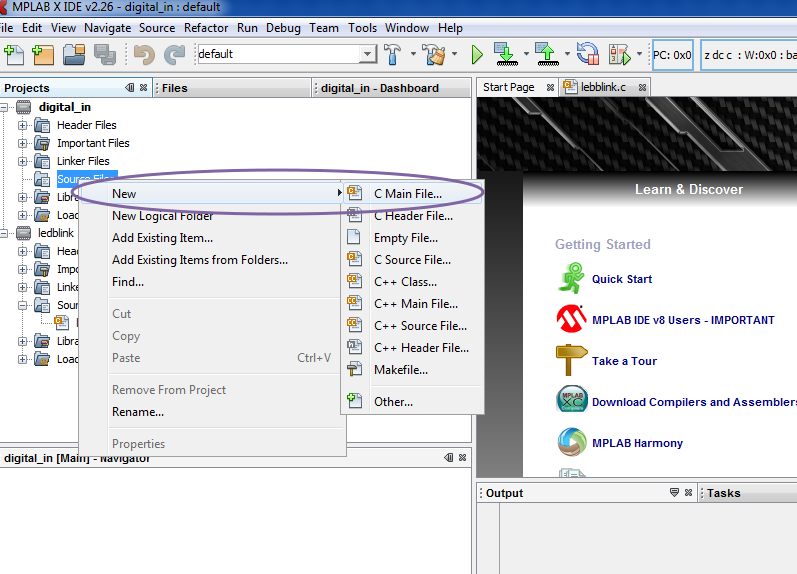 To write the C code we need to create a C main file. 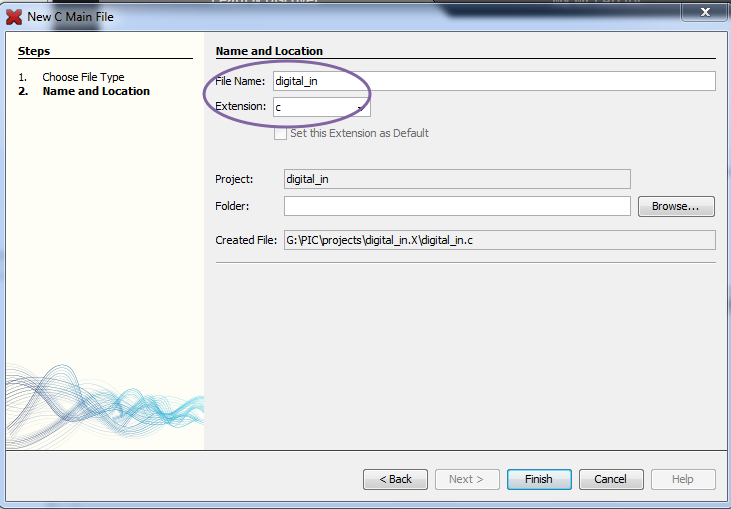 Do not add the .c extension next to your filename.It is selected from the drop down menu of Extension, seen below the Filename. 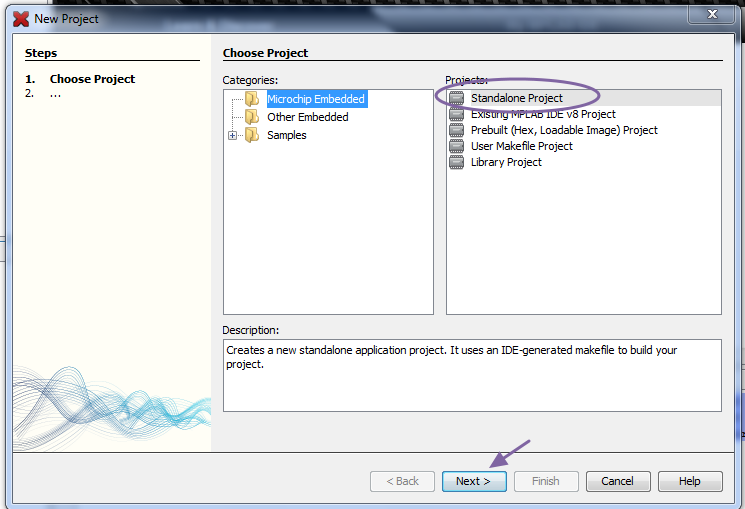 Click on Finish to see the code window on Editor pane. 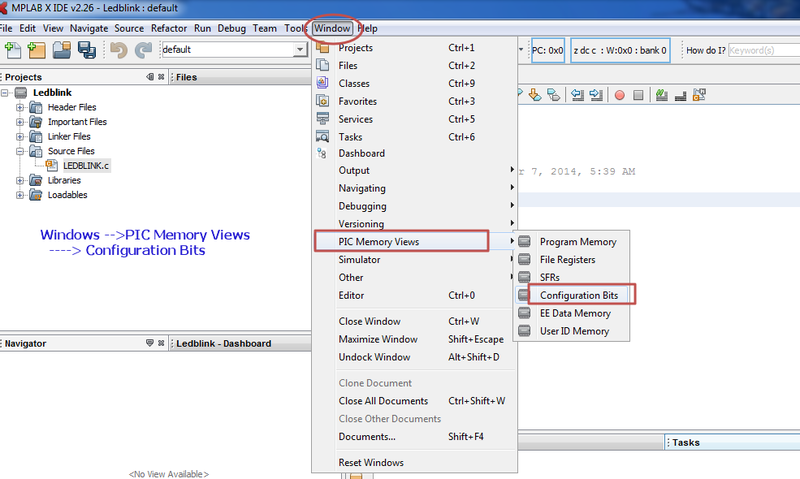 On the Task Pane area at the bottom the Configuration options are displayed. 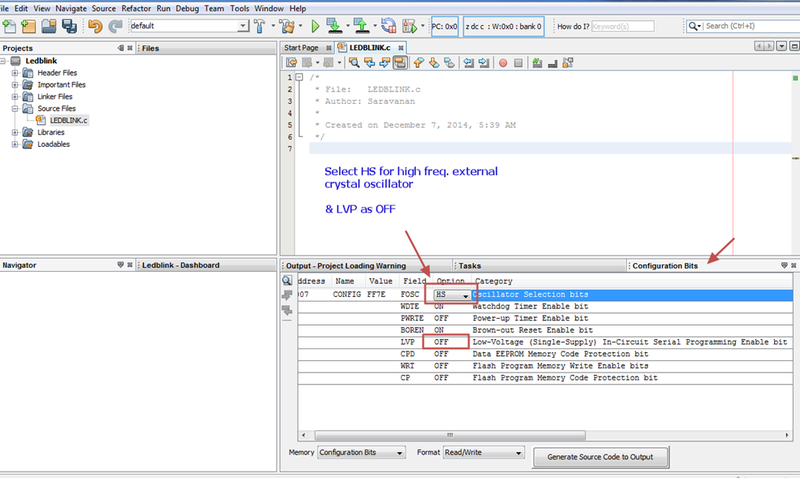 As we’re using an external High frequency crystal on the Demo board , select from the drop down menu against FOSC as HS . Other options you can leave for defaults.But the LVP should be selected OFF. 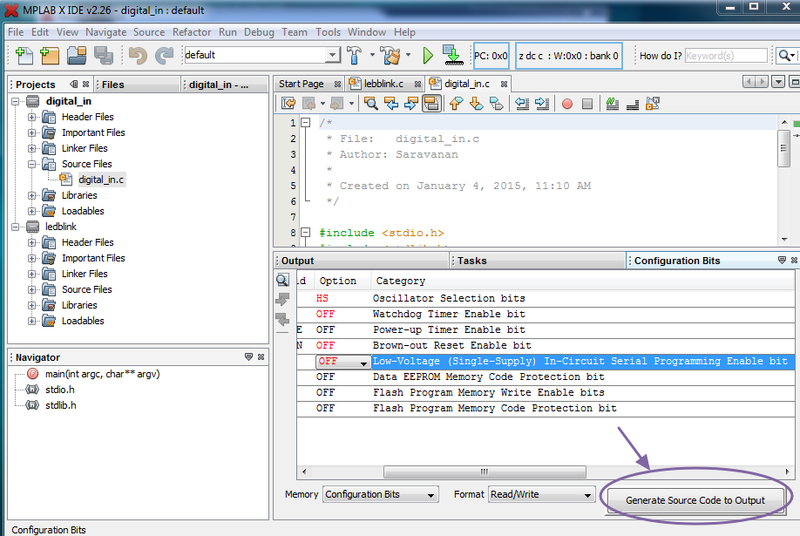 You can now see the Configuration code generated as per your settings. 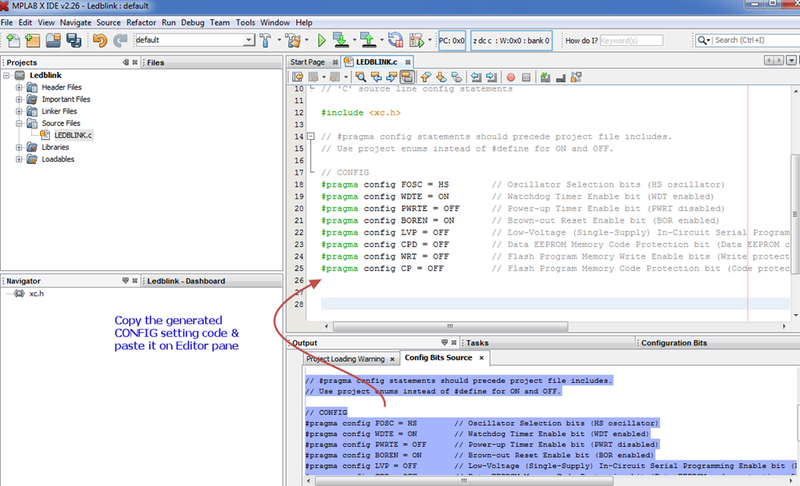 Copy the Configuration code generated & paste it on to the Code window of Editor pane . 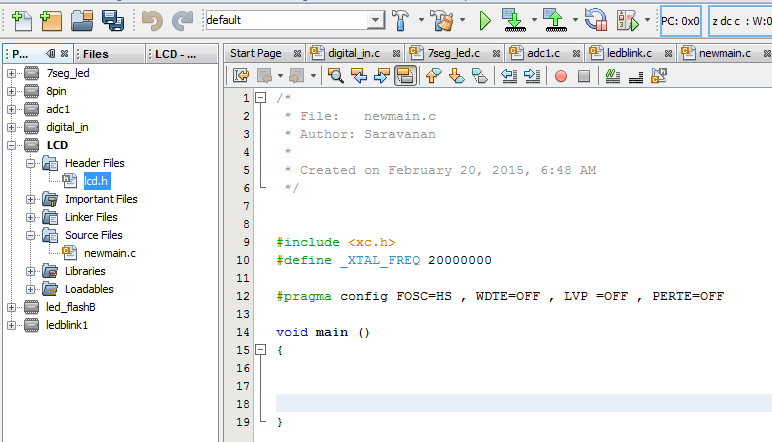 Before the #include <xc.h> statement you’ve to define the crystal frequency. 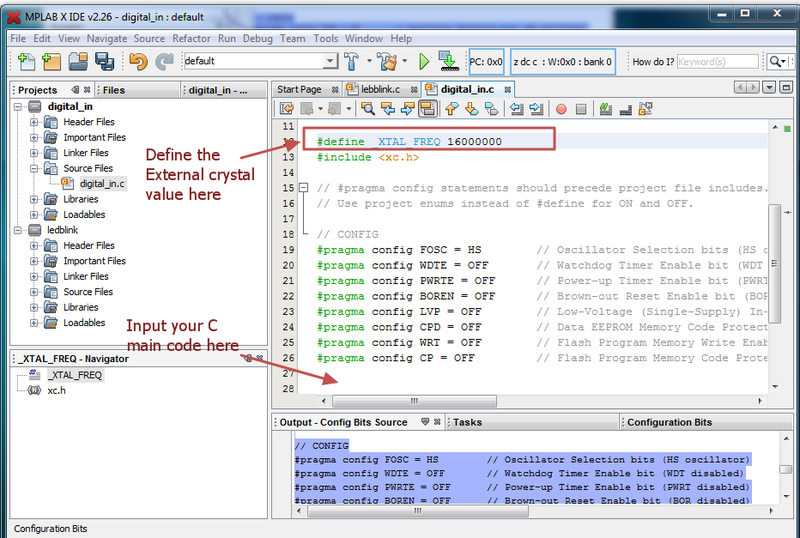 In this demo an external crystal value of 16MHz is used.This must be declared by the #define statement.If you miss this statement , any Delay statements in your code will show up a red squiggly mark. 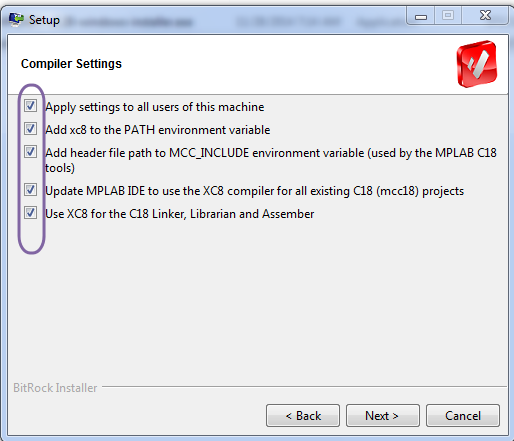 Now type in the following code just below the configuration code. 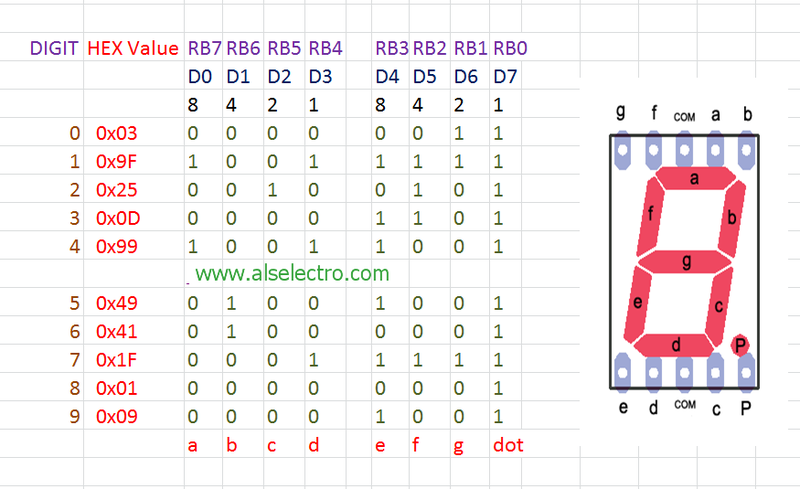 RD7 is made High by RD7=1 ,in turn makes the LED glow. 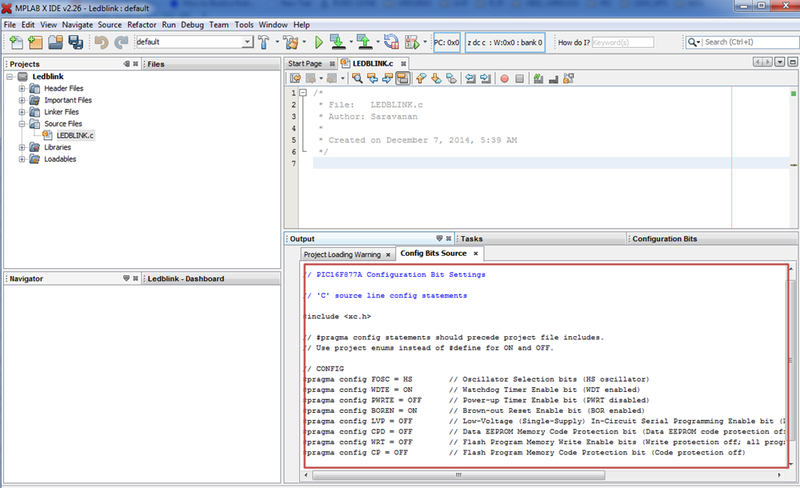 A delay of 1 second is given by __delay_ms(1000) Note the usage of double underscore before delay statement. 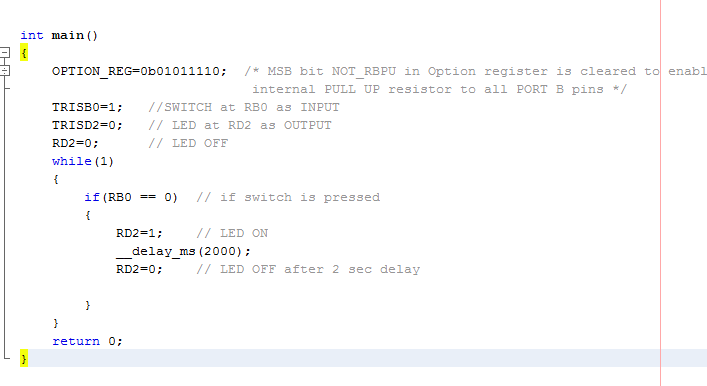 RD7 pin is then made low by RD7=0 , switching OFF the LED. Again a delay of 1 sec is given. 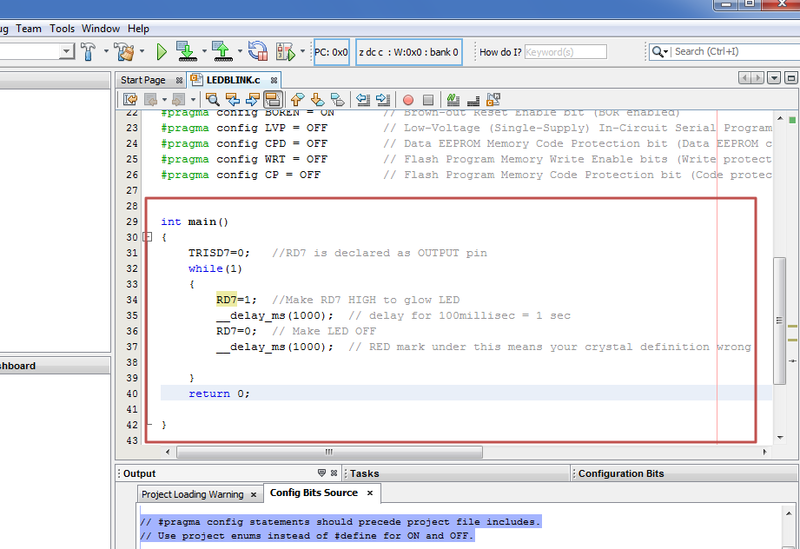 The never ending loop repeats , as a result you see the LED blinking at 1 sec interval. 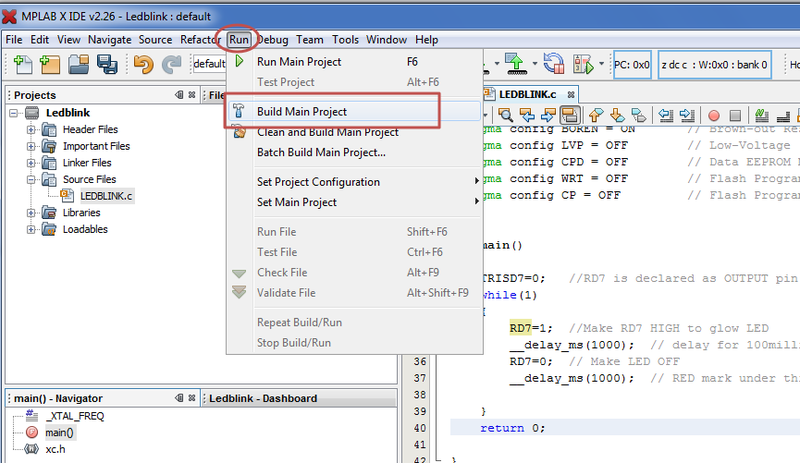 Click on Run —> Build Main Project to build the project. 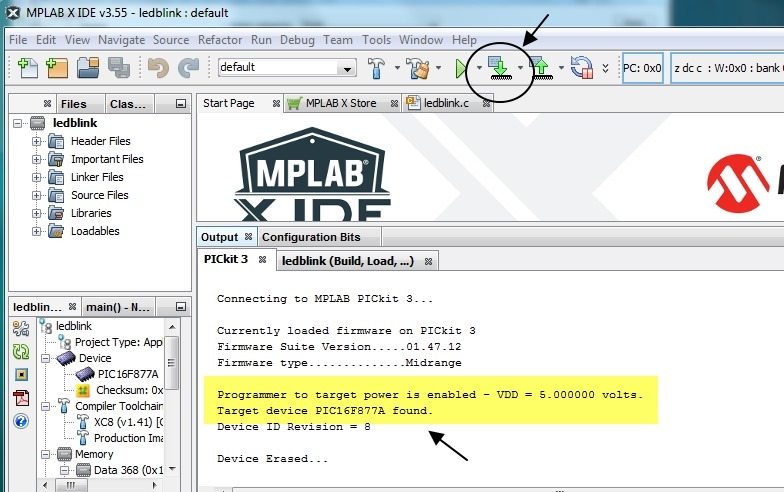 MPLABX will connect to the hardware PICKIT2 & program the target IC .The .Hex file is loaded on to the Target IC & you can see the LED connected at port pin RD7 blinking. 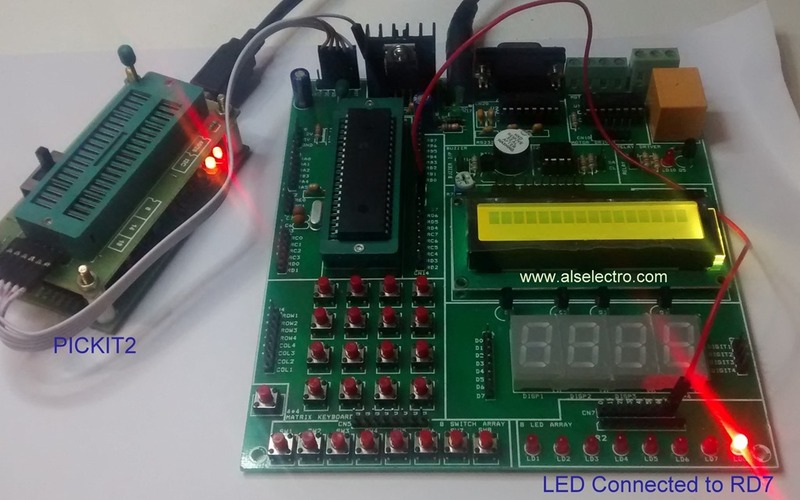 Below is the picture of Development board connected with PICKIT2 .An LED is wired to port pin RD7 . 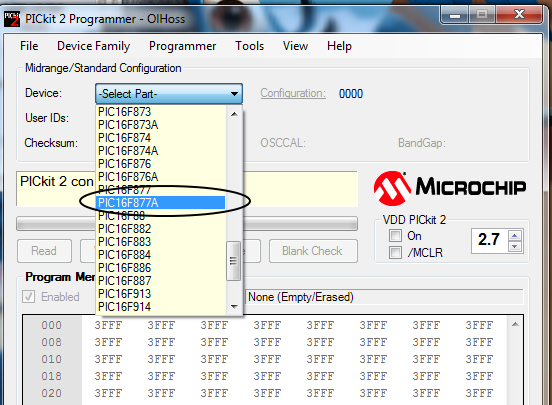 To transfer the HEX file on to PIC Flash memory you need a programmer like PICKIT2 or PICKIT3.As a student you may not wish to shell out the bucks to buy one.The solution is PIC BOOTLOADER & this post is a tutorial on how to implement Boot loader on a PIC16F877A chip. 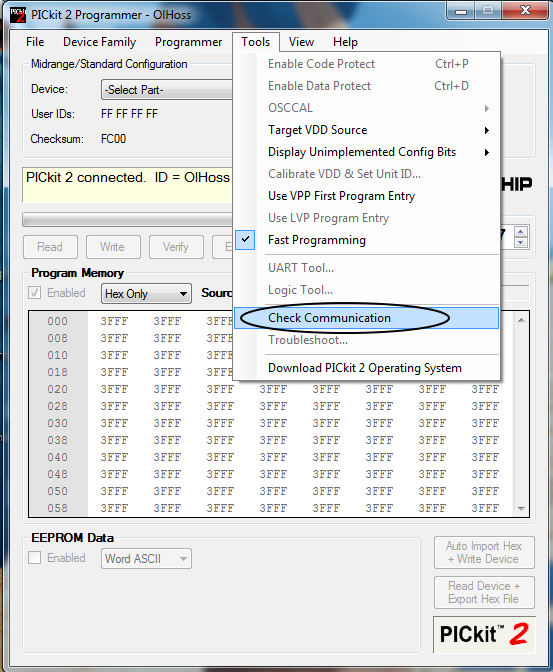 Remember that the Boot loader itself must be fused on to the Flash memory using an external programmer like PICKIT2.Once the chip is boot loaded the external programmer is not needed for further programming. 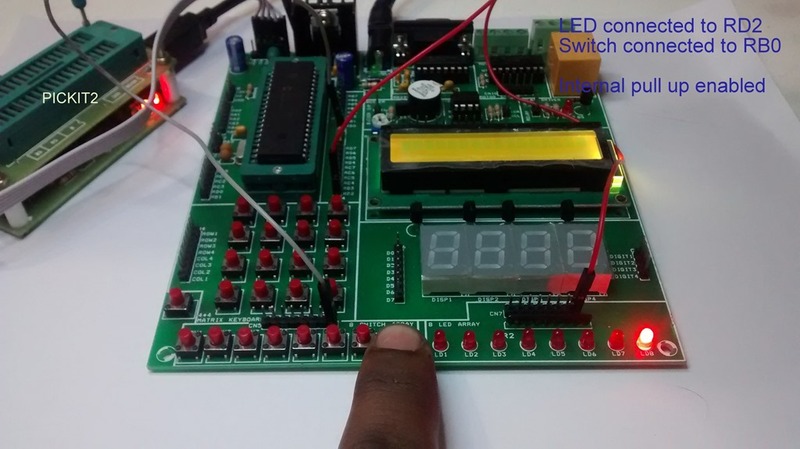 Whenever a boot loaded chip is re started ,the program counter jumps to the boot loader section & waits for the instruction which is fed through the serial communication port.A Bootloader is the first program which executes (before the main program) whenever a system is initialized. 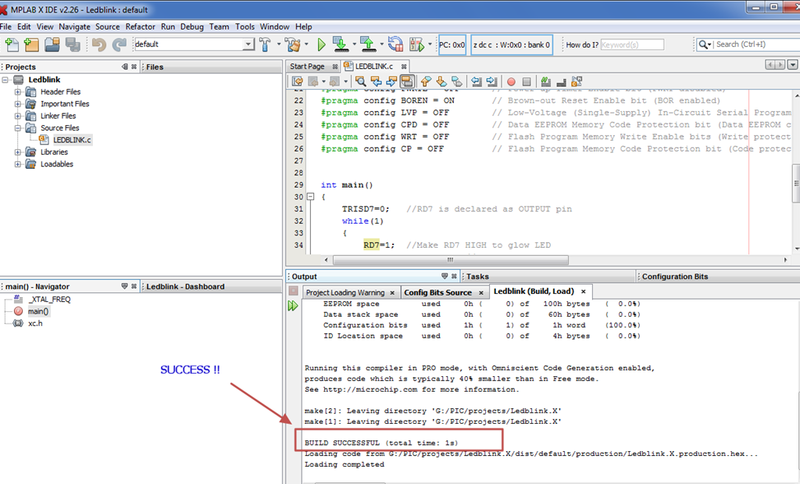 In case there is no communication in the serial port, the program counter will jump to the preloaded program at 0000H & executes the program. 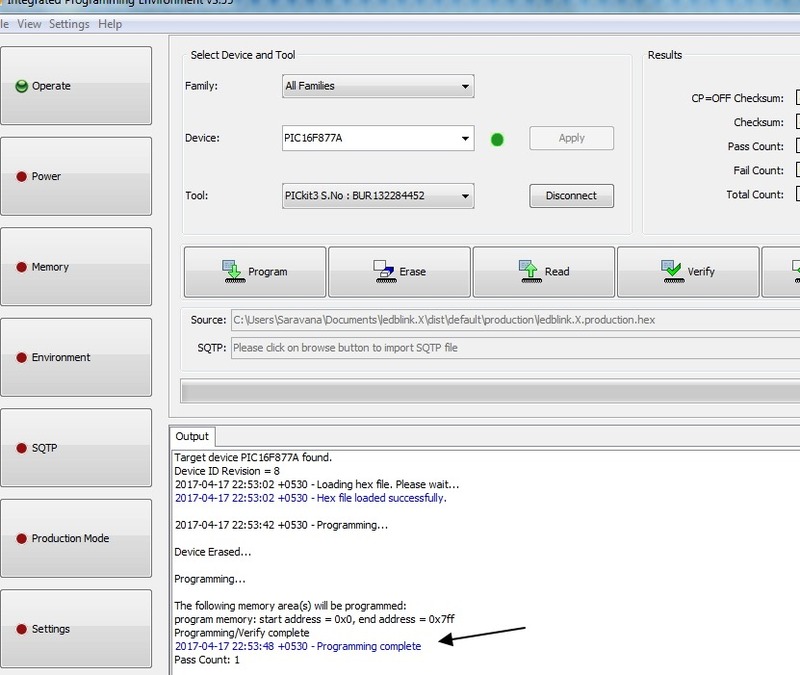 Mostly the bootloader resides in the bottom most area of the ROM but there are some cases where the boot loader can be configured in the top (like in PIC18F).The starting and ending address of the bootloader in the ROM depends on the product. 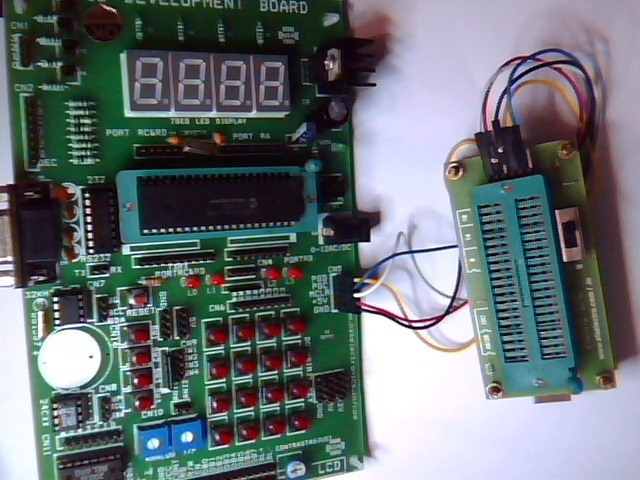 TINY BOOTLOADER is one such loader for PIC 16F & 18F ICs. 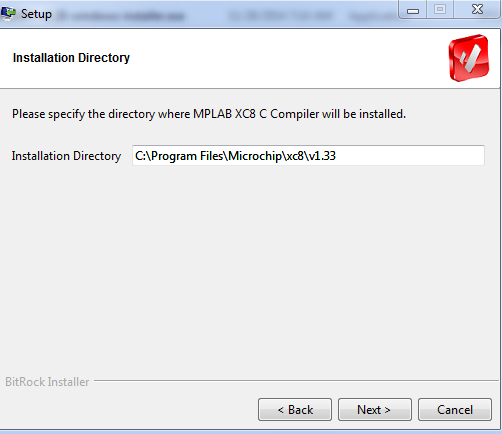 As all other bootloaders, this consists of a Windows application running on the PC and boot loader firmware running on the target PIC chip. 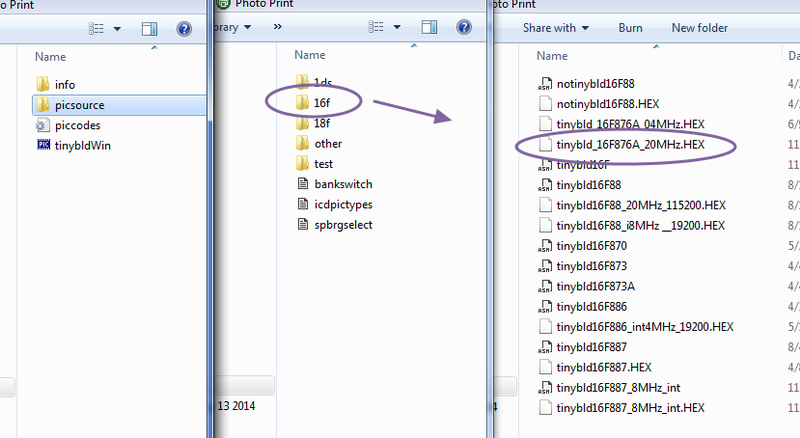 Unzip the downloaded TINY PIC BootLoader.Under the folder named “picsource” is given the Boot loader Hex files for PIC16F & PIC18F ICs.Select 16f & then select the hex file “tinybld_16F876A_20MHz.HEX “ . 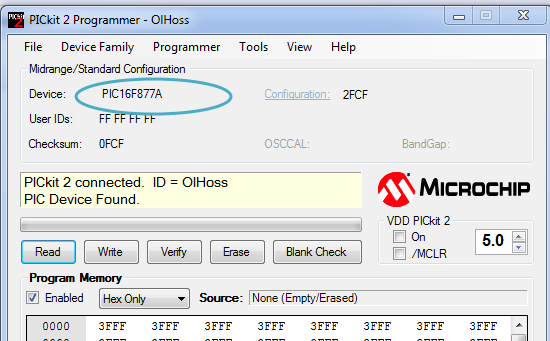 This is the boot loader firmware compatible to PIC16F877A .The selection of crystal frequency 20MHz is important & ensure that the target board uses the same value crystal 20MHz. 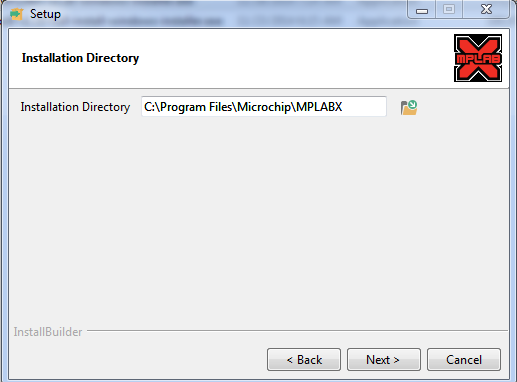 The “tinybldWin” found in the top folder is the Windows application through which you can load the HEX file on to the arget chip PIC16F877A. 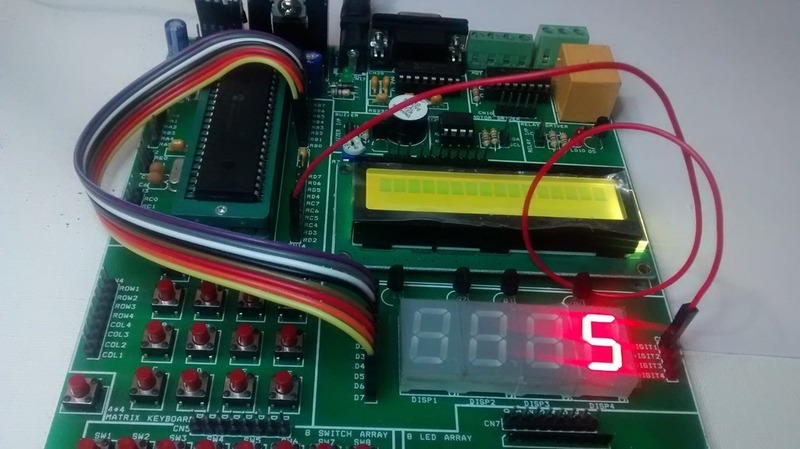 To fuse the Boot loader firmware on to the target chip you need PICKIT2 hardware. 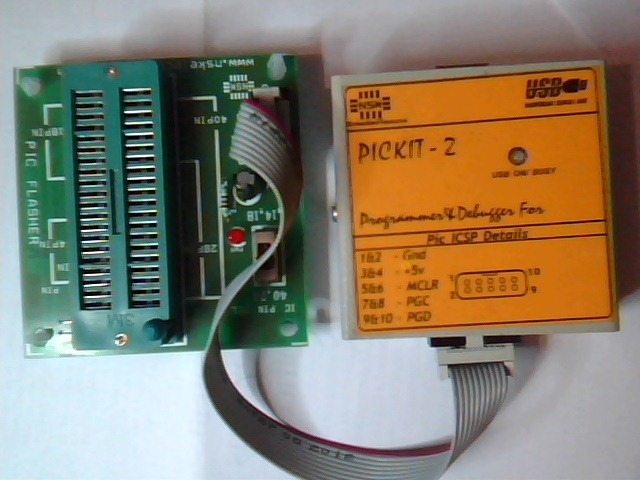 Place the PIC16F877A chip on to the ZIF socket of PICKIT2 programmer (pin 1 always near the handle).Start the application PICKIT2. 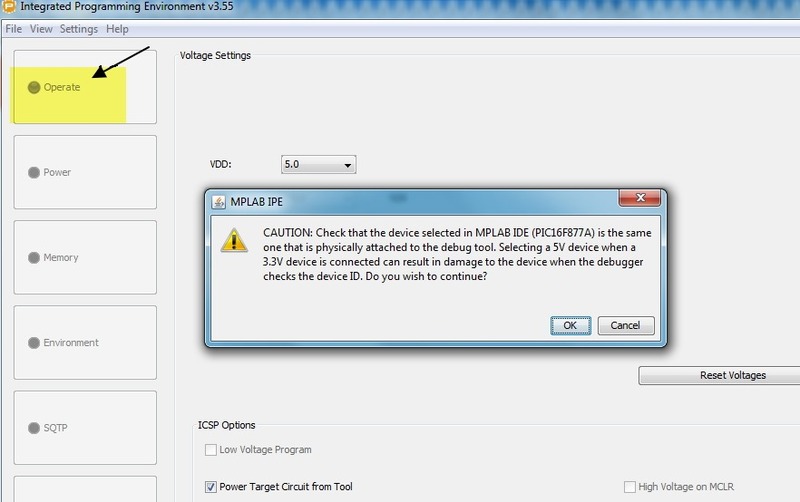 The hardware is detected automatically and device name is displayed PIC16F877A. 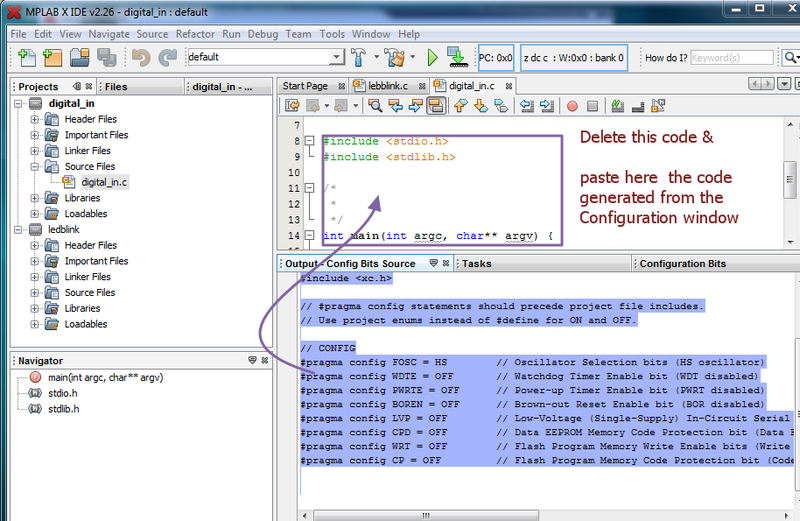 Click on WRITE to fuse the firmware n to the target chip. 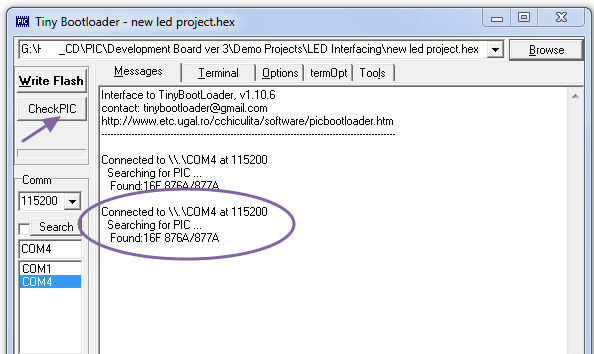 Now your PIC IC is BOOT LOADED & ready to accept your Program Hex files through the Serial port. 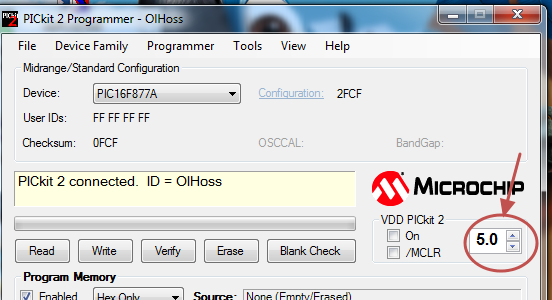 To load your program HEX files you need an USB to UART converter.Here I’ve used one built on Silicon Labs CP2102. 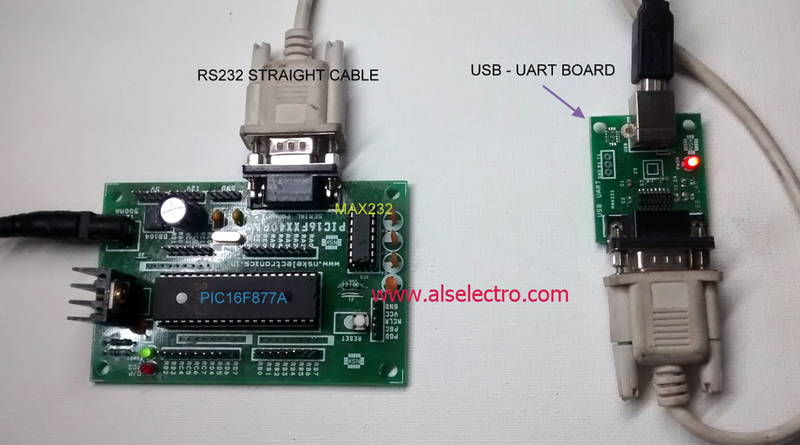 The converter is connected to PC using USB cable.A RS232 STRAIGHT cable is used to connect the Target board with UART converter. 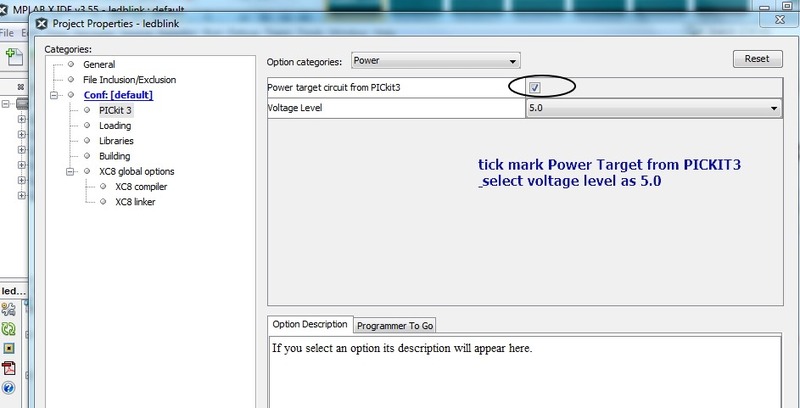 Check out the connections between PIC & MAX232 ICs on your target board. RC7 (PIN 26) goes to PIN 12 of MAX 232. PIN 13 of MAX 232 goes to pin 3 of the DB9 connector. PIN 14 of MAX232 goes to pin 2 of DB9 connector. 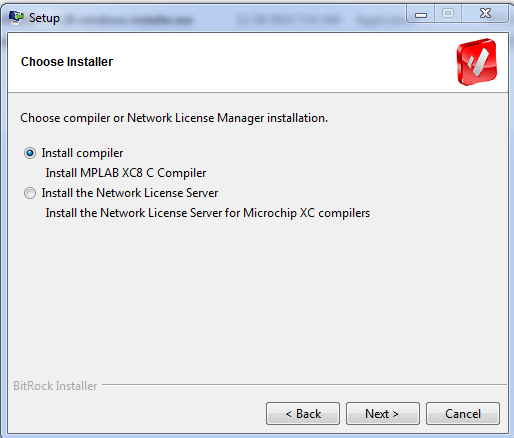 Double check these connections, otherwise your Target chip won’t be detected by the Windows application. 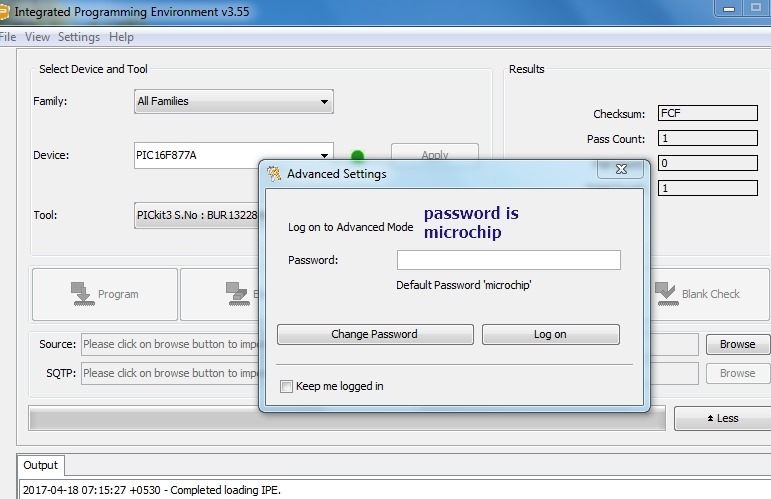 Now start the Windows application & click on CHECK PIC button.Your target chip is detected & displayed.The default Baud rate is 115200 . You can also check the Search button to scan for the port where the Target board is connected. 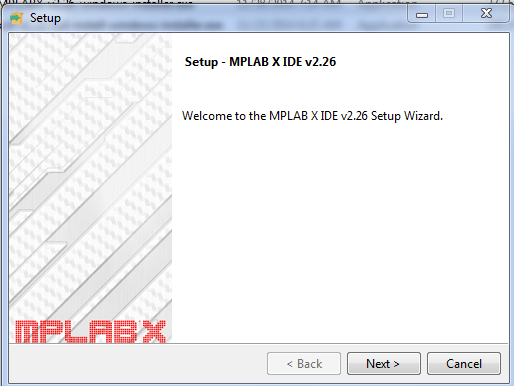 Click on BROWSE & navigate to the HEX file you’ve created using MPLAB. 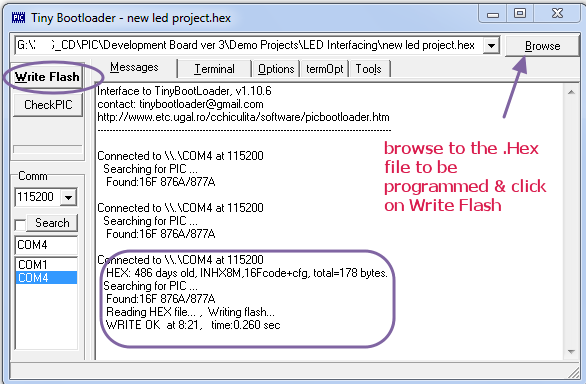 Click on WRITE FLASH to fuse the HEX file on to the Target. 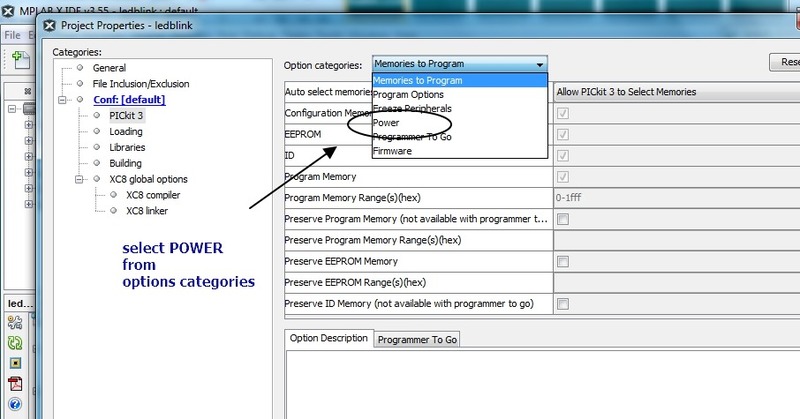 Now the Boot loaded chip is fused with your program.On Power On restart the chip will start the Boot loader.After 1 sec wait , it will launch your program. 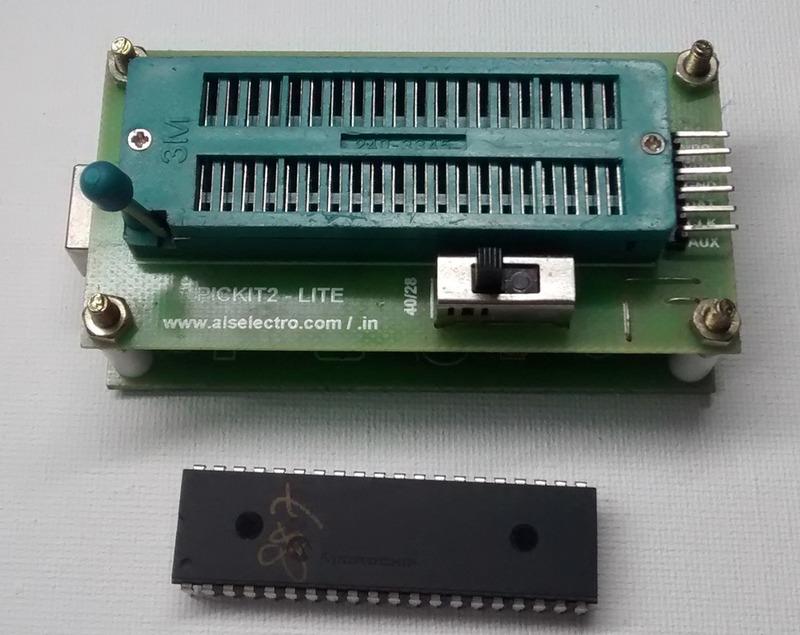 PICKIT2 Lite is a clone hardware to fuse the HEX file on to the target PIC Microcontroller.The advantage of this USB Programmer is that you can program the HEX file from within the MPLAB IDE & no standalone PICKIT2 software is required. 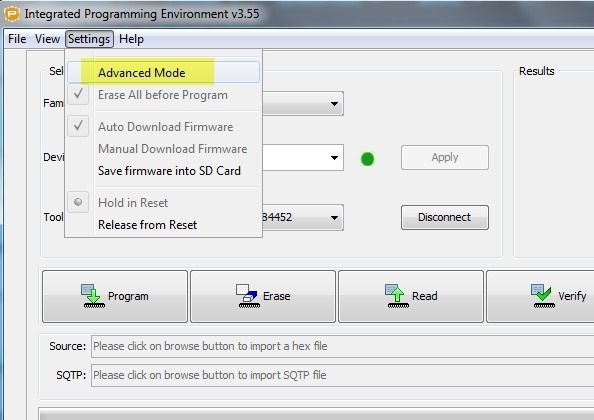 It is built on PIC18F2550 IC which is loaded with PIC Firmware & Boot loader.PIC18F2550 has an inbuilt USB interface avoiding the need for an external USB-UART circuit. 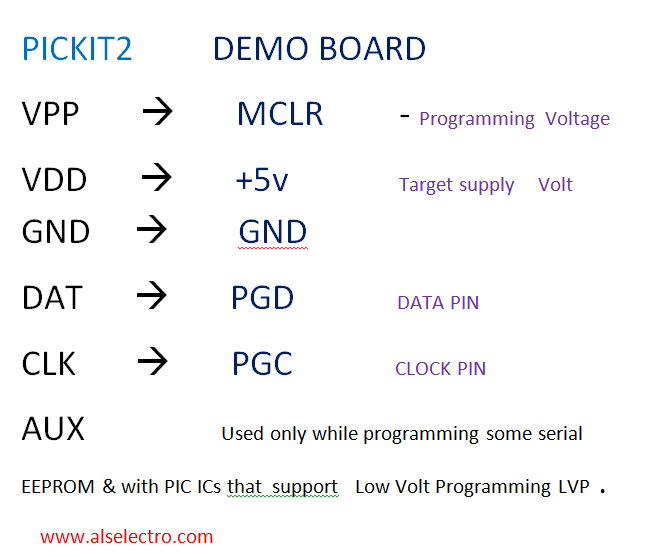 are used for In Circuit Programming.While programming , a 12v is generated by PICKIT2 & applied to MCLR pin of PIC controller , while data flows in through PGD pin controlled by the PGC Clock cycle. 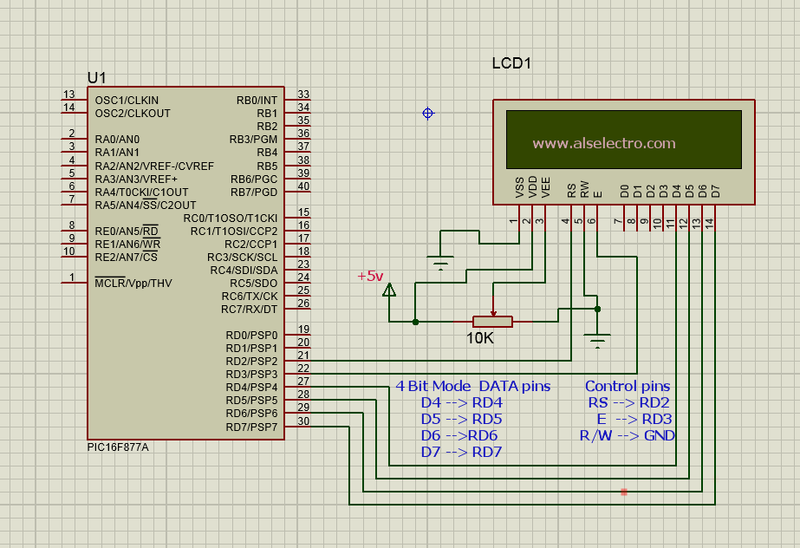 The AUX pin is used only with PIC microcontrollers that support LVP –Low Voltage programming. 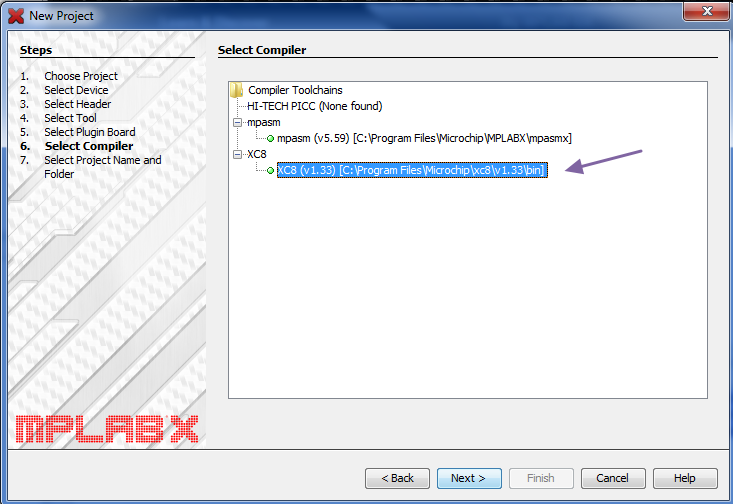 Now you can open the project in MPLAB IDE & from within the MPLAB IDE you can initiate PICKIT2 & Program the HEX code on to the Flash ROM of PIC chip. 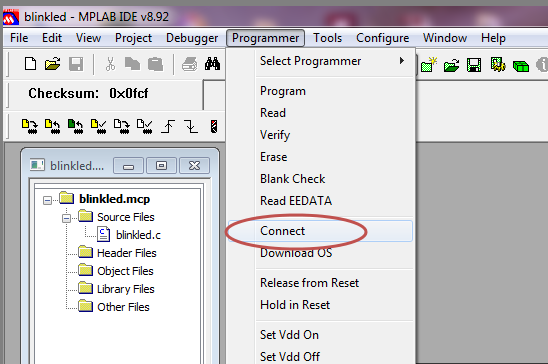 Connect USB cable to PC.Open the project in MPLAB IDE. Your hardware will be detected .The IC placed on the ZIF socket is also detected. 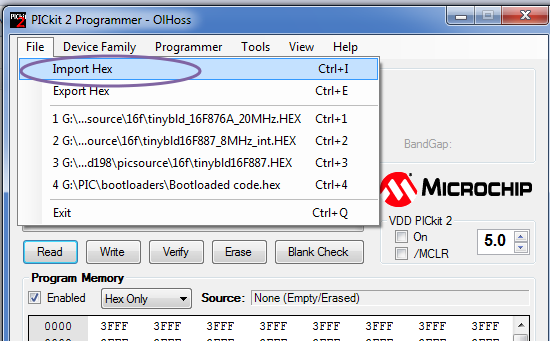 Now you can click on Programmer –> Program to fuse the HEX file on to the PIC microcontroller. In this post we shall discuss the following common problems faced by newbies & their solutions. 1. 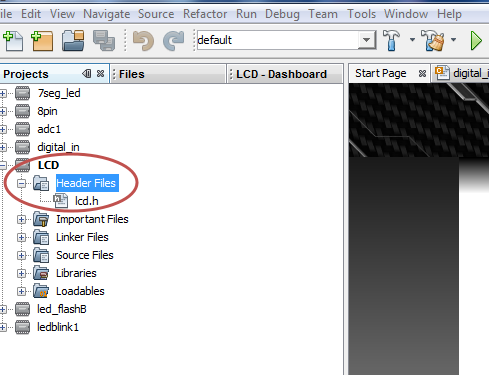 My .c file is not showing under Source files. 2. 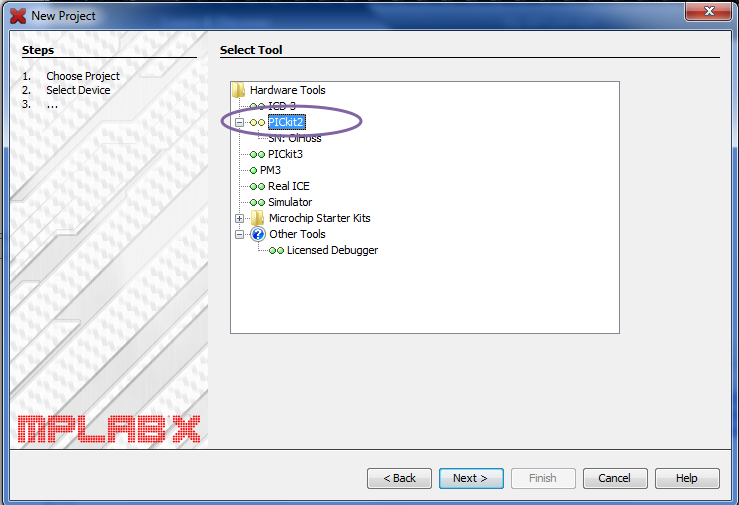 After selecting HITECH UNIVERSAL TOOLSUITE from under Toolsuite Contents , there is an X mark seen near the Location. 3. 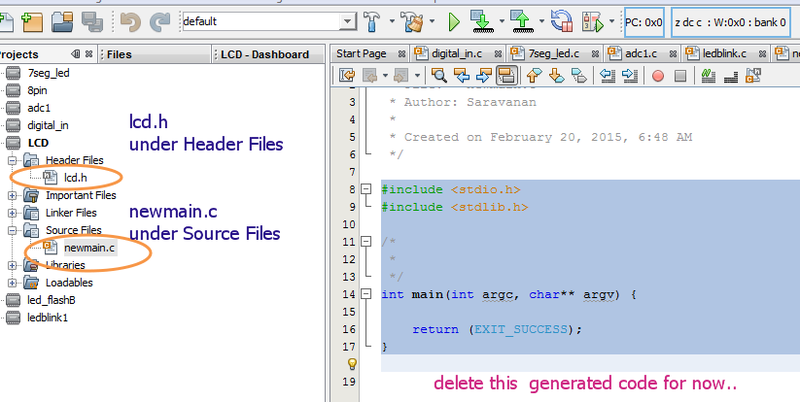 I do not see the .HEX file generated. 4. My Build is successful. 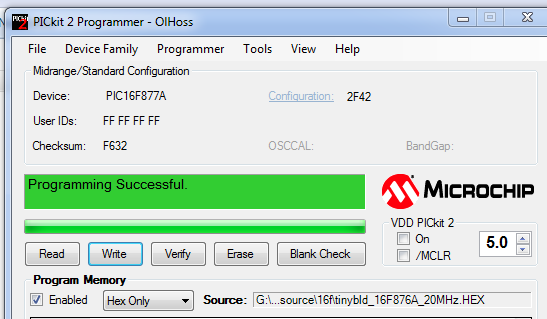 Fusing of HEX file is ok , but my project is not working. 5. 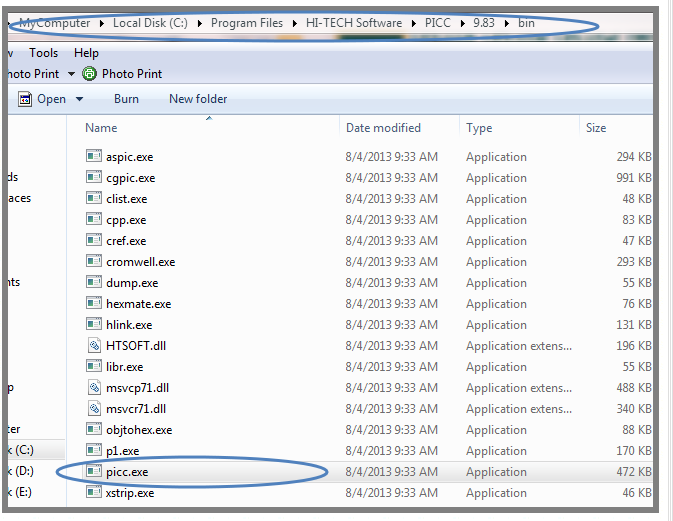 PICKIT2 complains that there is no Configuration bits ,while importing HEX file. 1. 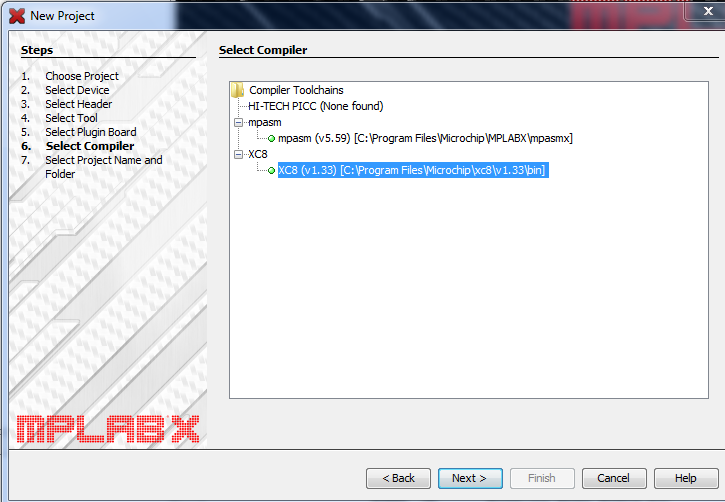 When you try to add your C code file .c by right clicking Source files , it lands up under Other Files.The reason is , you’ve not selected the Tool suite for HITECH C compiler & it is in Microchip ASM tool suite for Assembly language.Unless you select the Hitech C you can’t add a .c file to Source files. 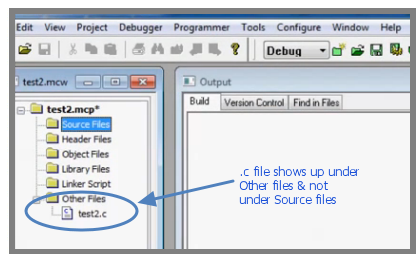 Now your .c file will appear under Source Files. 2. 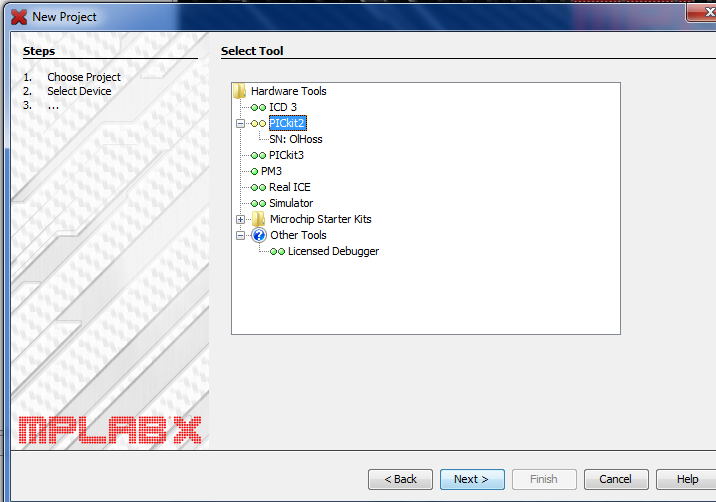 You see an X mark near the Location while selecting Hitech Universal Toolsuite. The reason is that while installing the HITECH C Compiler you’ve selected a different location other than C: or you might not have checked the “Set environment path “ while installing Hitech C compiler. 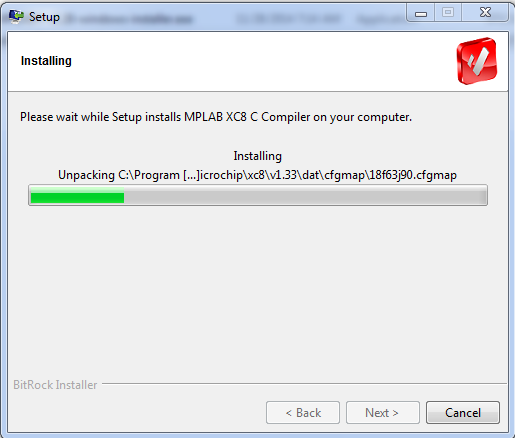 Click on browse next to Location bar & go to the location where you’ve installed the C compiler & select it. 3. 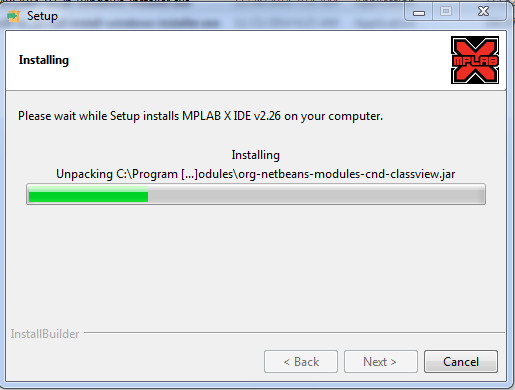 Your BUILD is successful , but you do not see the HEX file. 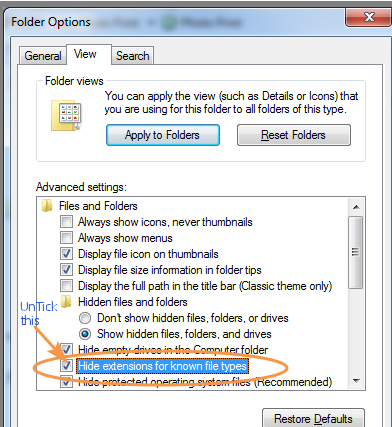 Go to Tools –> Folder Options of the Windows Explorer . 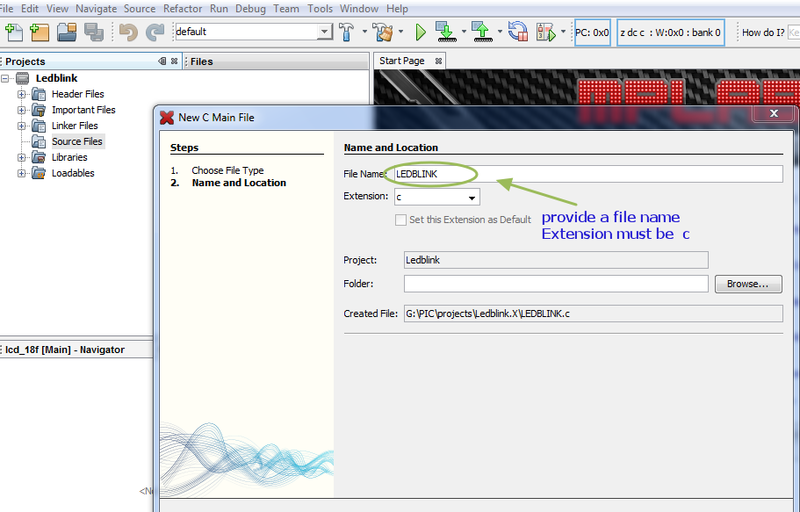 Under VIEW tab Un tick “Hide extensions for known file types “ & click OK.
Now you can see the .hex file. 4 & 5 . 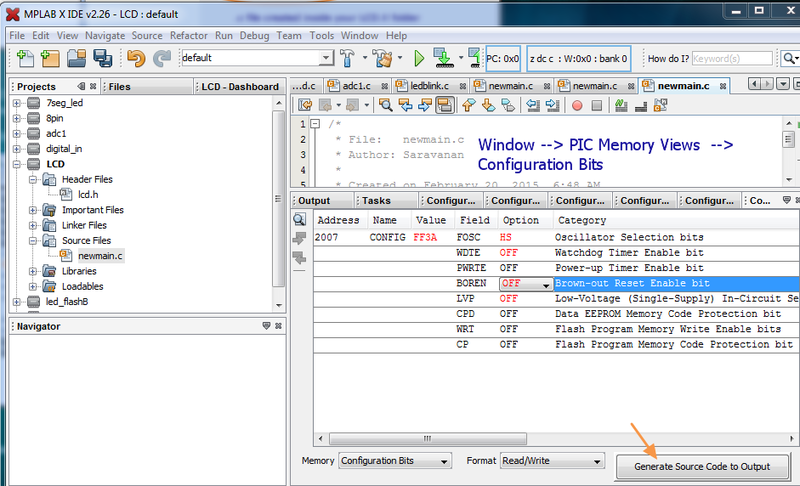 Setting the Configuration bits & including it in the C code is important. 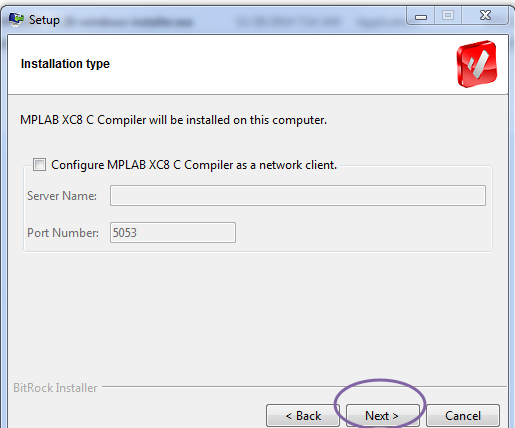 Under Configure select Configuration Bits. A new window opens. 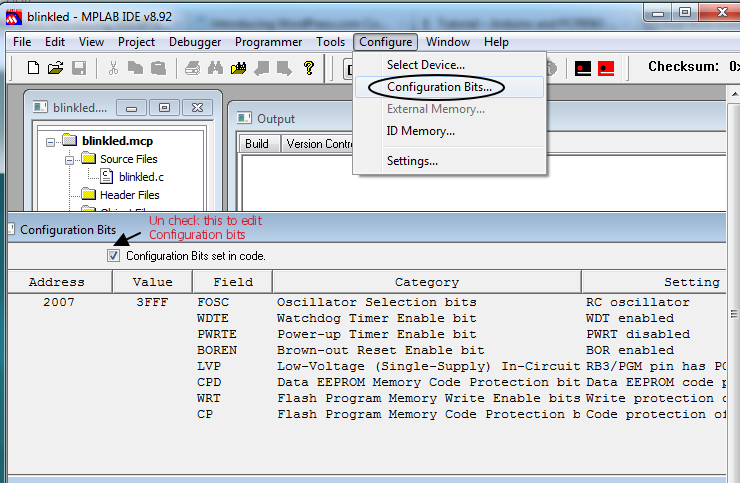 Uncheck the box “Configuration Bits set in code “ to enable editing the bits. 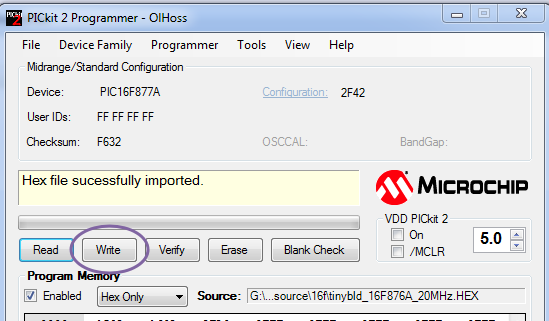 By default the Oscillator is set to RC Oscillator.But in your project you use an external crystal of 8 or 20MHz.From the drop down menu select HS Oscillator which stands for usage of High Frequency oscillator. Disable Watch Dog timer,Power up timer & Brown out Reset. 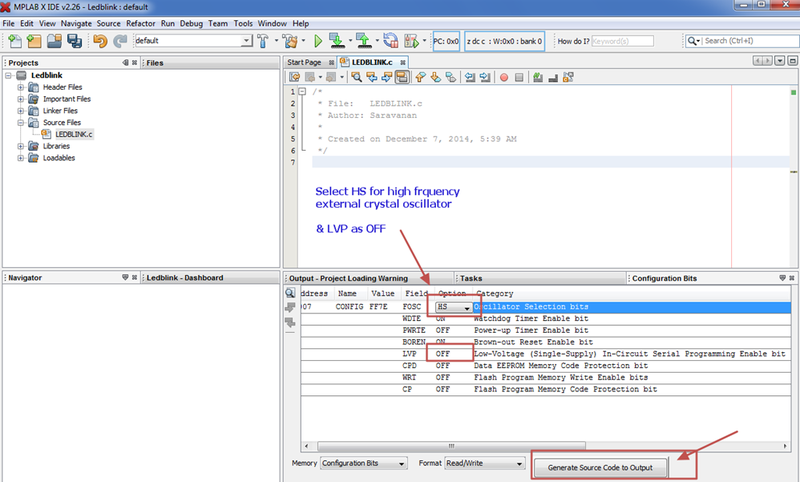 Generally LVP (Low Voltage Programming) is not used .So select “RB3 is Digital I/O,HV on MCLR must be used for programming “ . This Hex value should be added in your CONFIG statement of C code.Note the usage of two underscores __ before CONFIG. 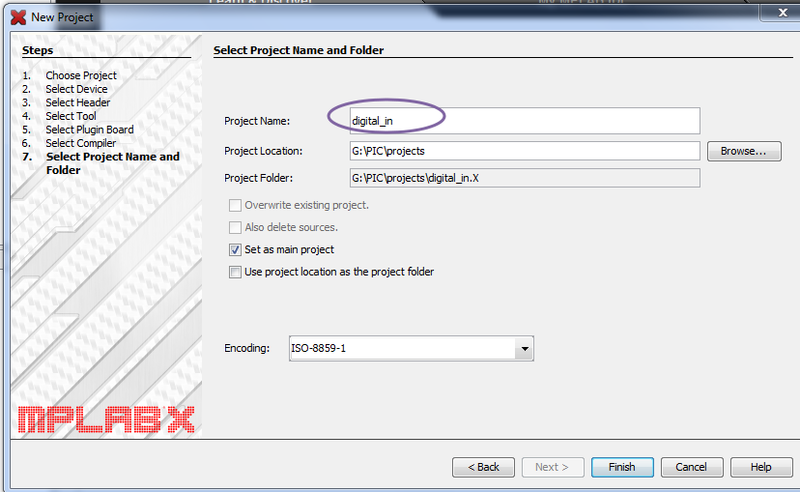 Now build your project to generate HEX code with Configuration bits. 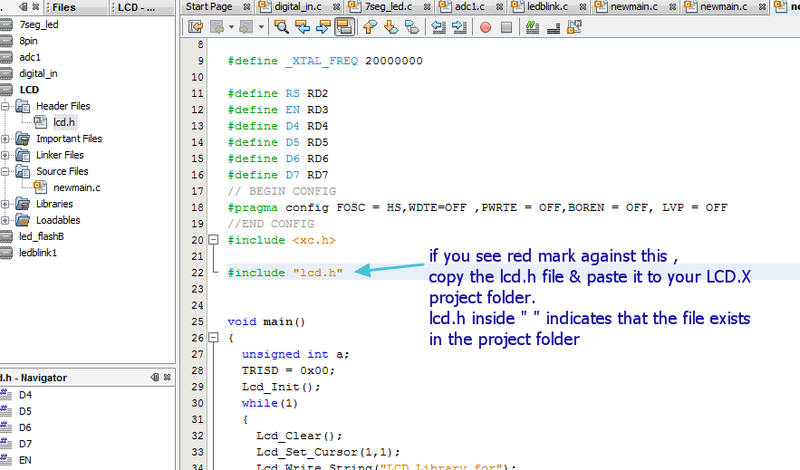 In the previous post we’ve created a .HEX file from C code. 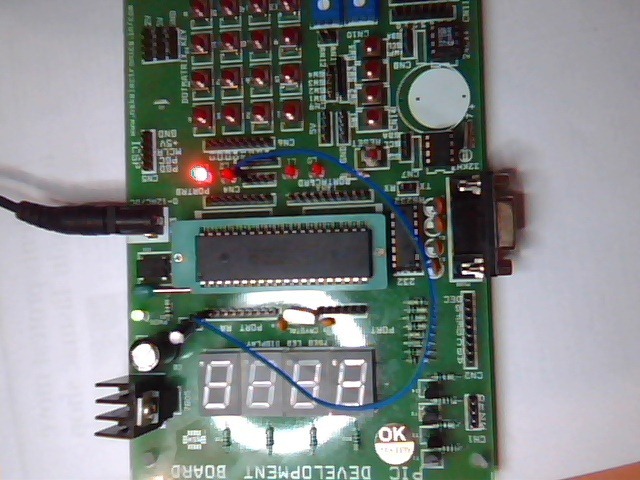 Now we shall see how to fuse that file on to the PIC 16F877A IC using PICKIT2 clone hardware & finally displaying the result using a Demo project board. 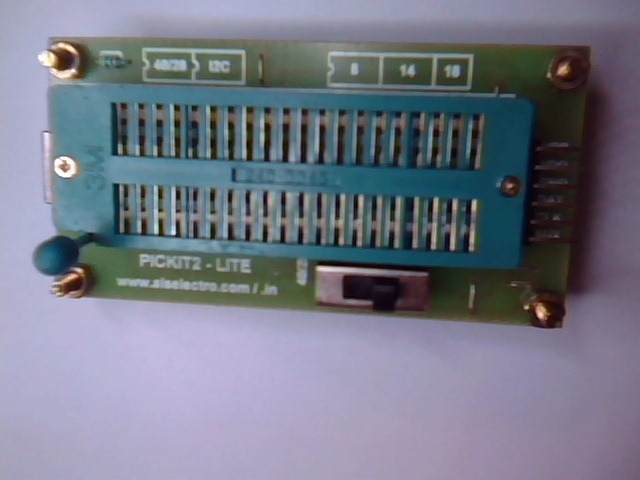 The PICKIT2 clone hardware is shown in picture above.It has an inbuilt PIC18F2550 controller loaded with bootloader & firmware.It is an USB device and doesn’t need any external power source. 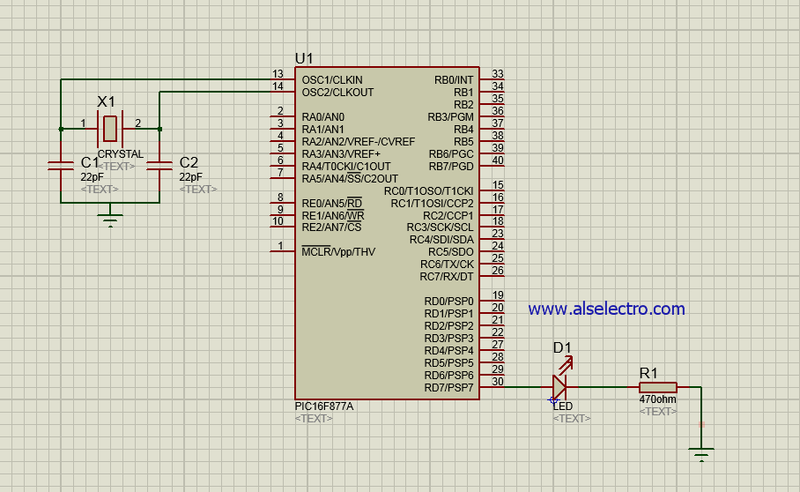 The ICSP (In Circuit Serial Programming) connector is converted to a 40 pin ZIF socket using a Flasher board.This PICKIT2 clone has also an inbuilt voltage converter to apply 12v DC to MCLR pin of PIC IC while fusing the HEX file. 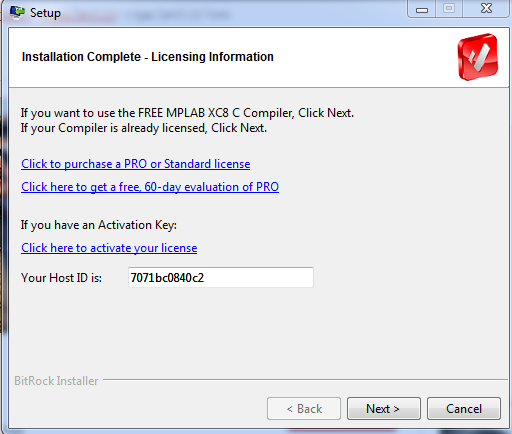 You need to download the PICKIT2 standalone software from here. 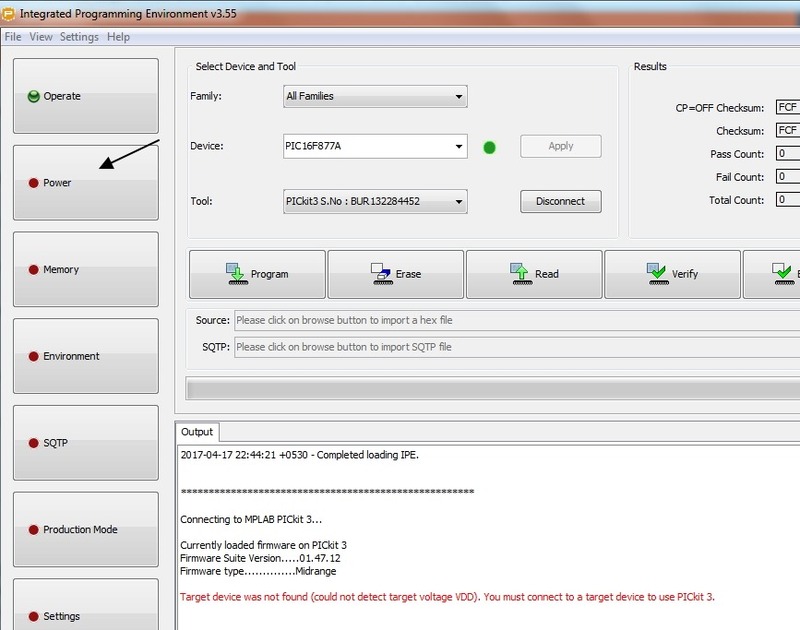 Open the PICKIT2 software.If the hardware is already connected to your PC , it will automatically detect it. 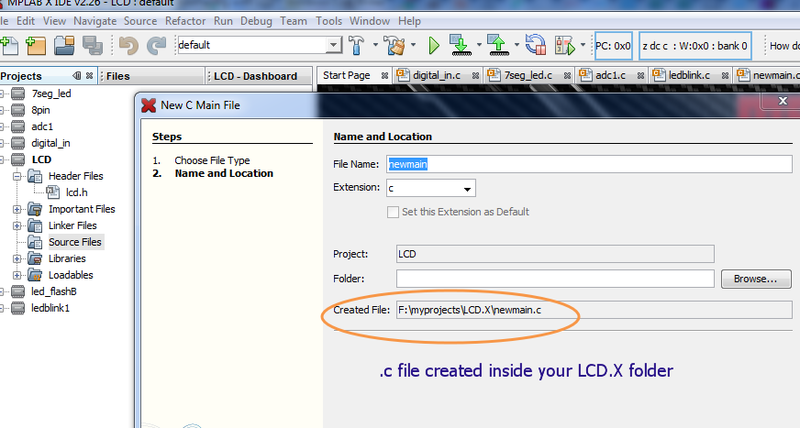 Select the project IC from the drop down menu , here it is PIC16F877A. 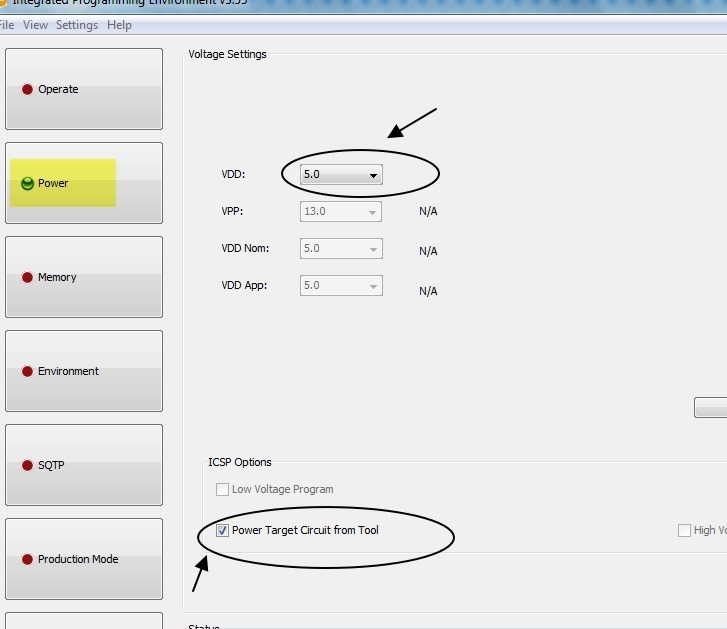 The supply voltage changes to 5.0 . Place the 40 pin IC on to the ZIF SOCKET of FLASHER BOARD. 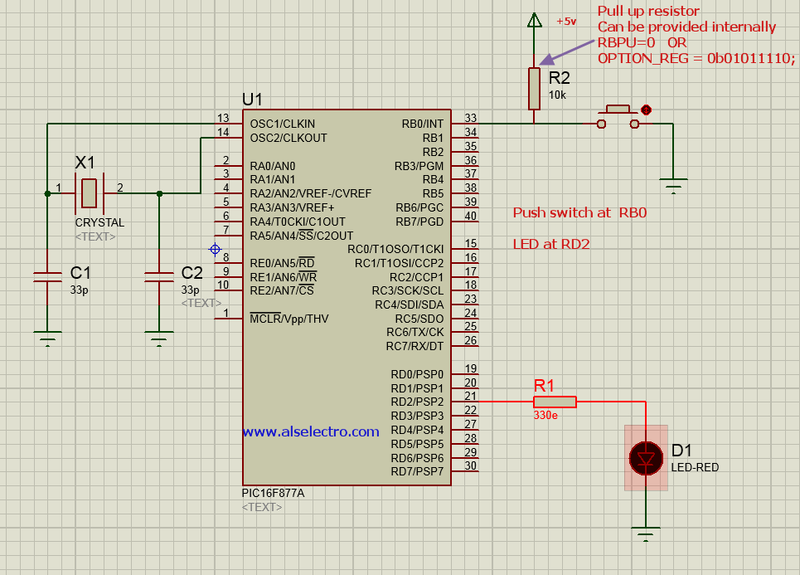 Ensure that pin 1 of IC is near the handle of ZIF socket & the selection switch on flasher board is set to 40 pin. 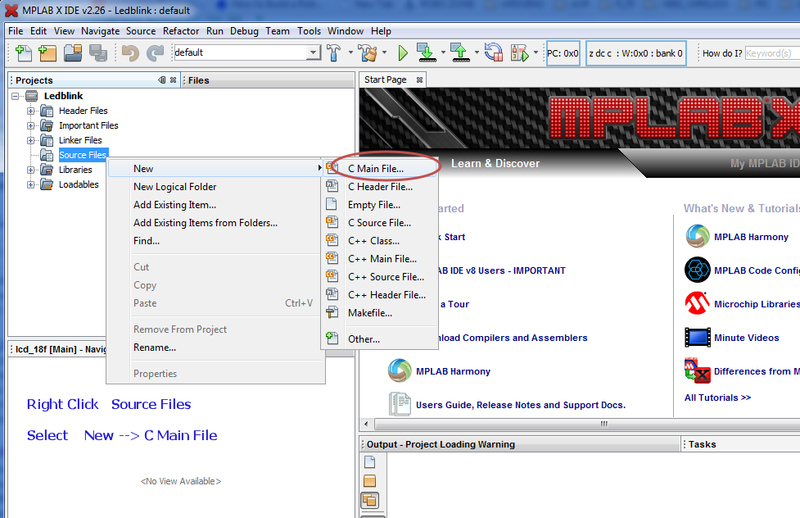 Click on Import Hex under File & browse to the location where the .HEX file is stored.This file is created in MPLAB IDE as in previous post. 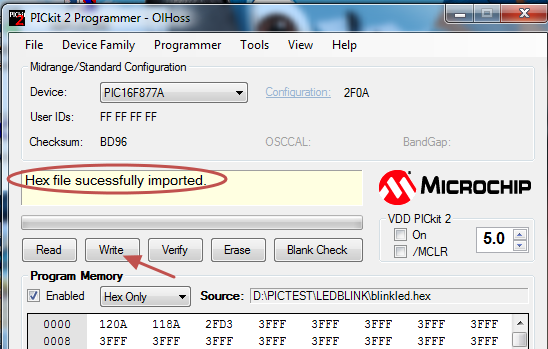 When you see “Hex file successfully imported “ , click on Write to fuse the HEX file on to the PIC IC. Green LED on PICKIT2 hardware changes to RED while it is fusing the file. 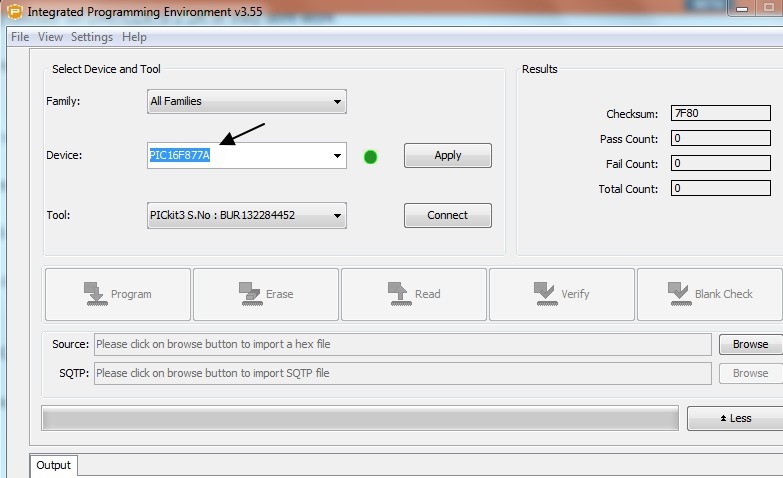 After Programming is successful you can remove the IC from the ZIF socket & use it in your project.